Based on the results of the members of the jury voting Top 10 entries in every zone of Europe are selected. 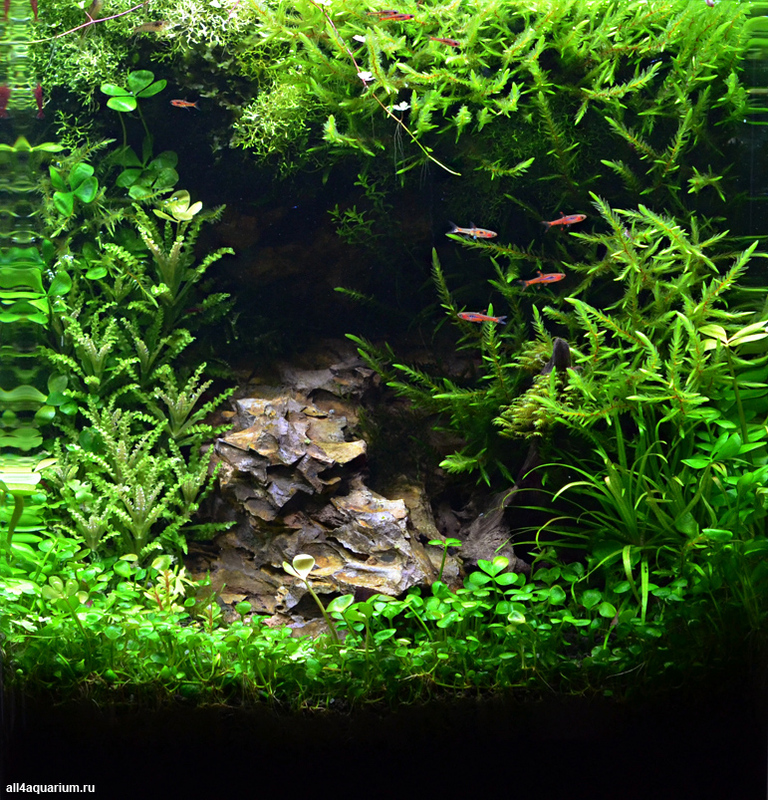 In June authors of these 40 aquaria got from Germany DENNERLE Scaper's Tank Complete to set them up for the 2nd stage of the contest till October 31, 2014. Everyone having DENNERLE Scaper's Tank Complete 50 l can paticipare in the 2nd stage of the contest. Prize pool of the 2nd stage of the contest is 3,000 euro. Animals: Rasbora espei, Neocaridina heteropoda var. Sakura, Caridina japonica, Clithon sp. Animals: Neocaridina heteropoda var. Sakura, Boraras brigittae, Neocaridina davidi var. Yellow, Neocaridina davidi var. Orange, Melanoides tuberculata, Clithon sp. Plants: Phoenix moss, Cladophora aegagropia, Taiwan Moss, Hemianthus sp. Animals: Boraras merah, Caridina cantonensis sp. Animals: Otocinclus affinis, Hemigrammus erythrozonus, Neocaridina heteropoda var. Plants: Hemianthus callitrichoides, Pellia moss, Alternanthera reineckii, Taxiphyllum sp. 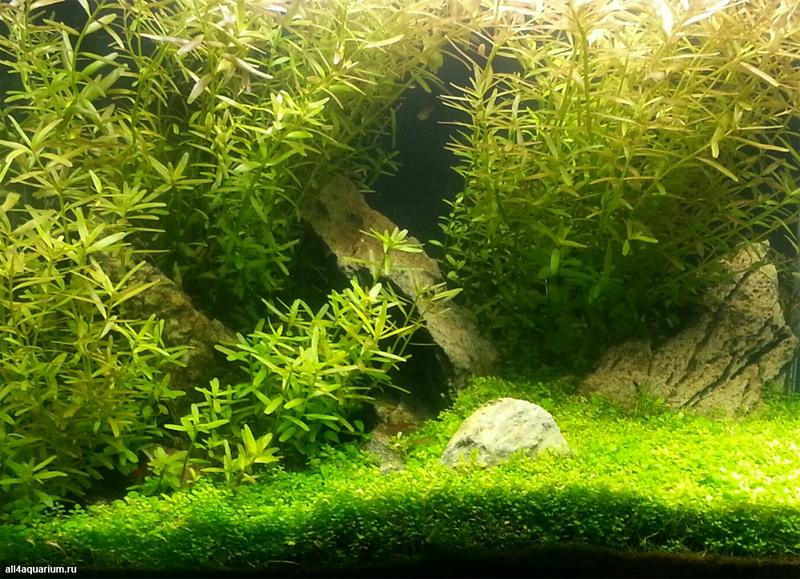 Plants: Eleocharis mini, Christmass moss, Proserpinaca palustris, Riccia fluitans, Hemianthus callitrichoides Cuba, Staurogyne sp., Hygrophila sp. Animals: Neocaridina heteropoda, Caridina cf. cantonensis, Planorbarius sp. Animals: Poecilia reticulata, Planorbarius corneus, Physa sp. There are some very nice tanks...Congrats! Good jobs e good luck! some really nice layouts, congrats. De bien belles réalisations ! Je souhaite bonne chance aux membres du jury. There are some really beautiful aquariums. But this is a competition and I think that it is unacceptable not to remove equipment (filters, heaters, thermometers, etc.) from the aquarium before picture. Много ми харесва, има някаква загадъчност в твоя аквариум. Some good layouts in the contest ! I hawe seen about 20 good aquarium. Good luck! 5 or 6 great works... 15 very good... and others... Wish luck to everyone! I do not believe in public's voting, there is to much friendship and strategy, the only vote that count is by professionnal or experimented aquascapers. Stefan Walter (Germany): My personal focus lies on innovation, trying to fully explore and expand the existing scheme how to scape aquaria. 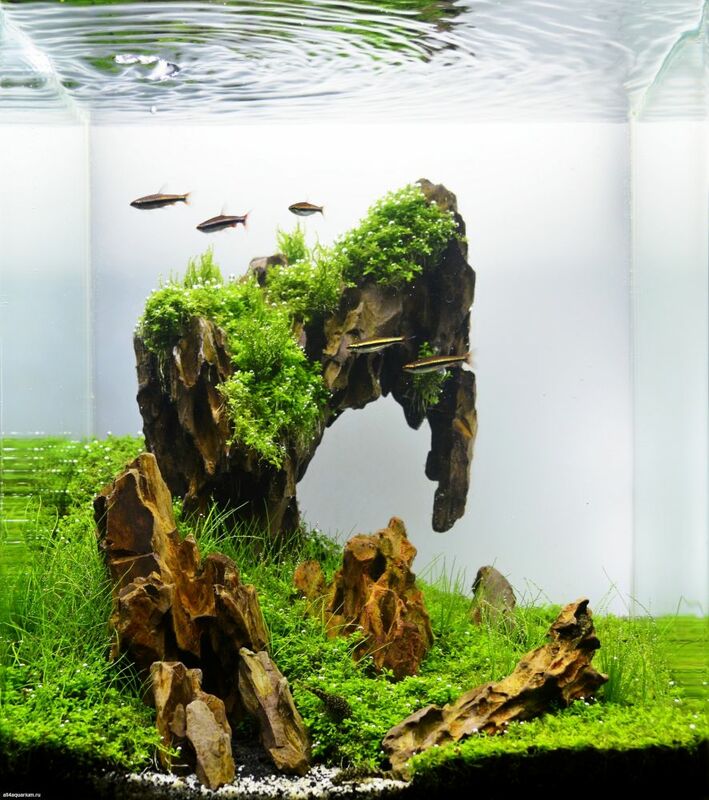 My experience, apart from the daily Dennerle experience, lies on the international view on site with regard to aquascaping in the various countries I take care of or during my travels through the world. 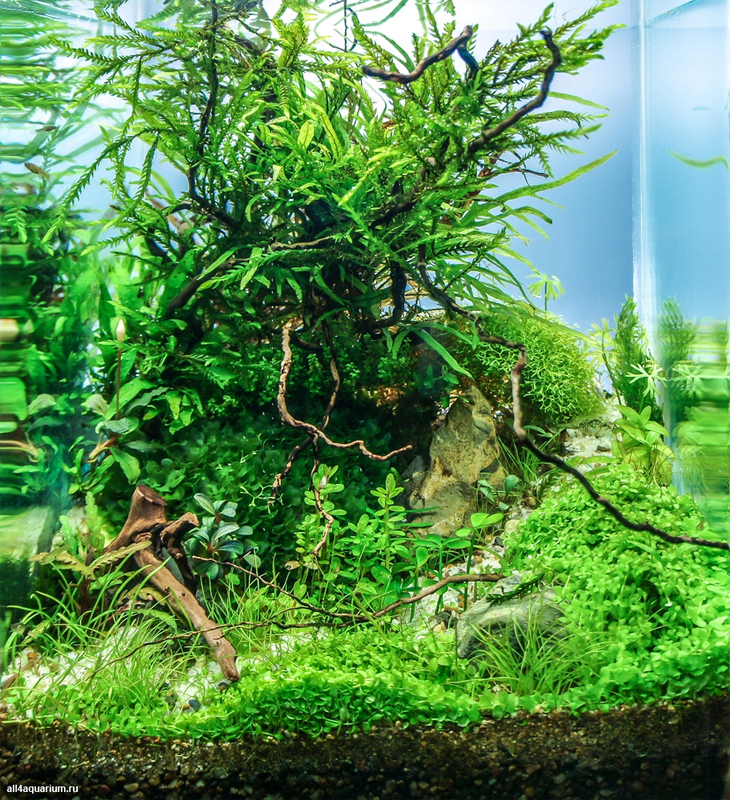 I would also like to point out the majority of the contestants did a good job trying to recreate what they understand of aquascaping from everything they might have seen before or done themselves previously. Everybody deserves an applause for taking part. Judging remains, apart from standard features “how to” always something personal and momentary. Also aquascaping will develop. Therefore try again and again and do not let anyone discourage you when it comes to your own view and conviction of YOUR aquarium. Thanks to everyone. 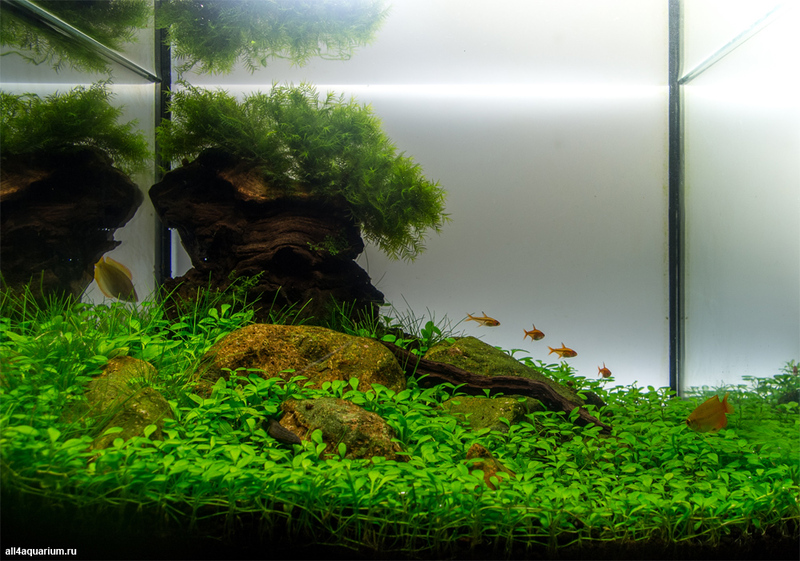 Balázs Farkas (Hungary): I congratulate to all entrants, it is incredible how much the European nano aquascaping level has evolved in the past years. I have found at least 40 scapes that are a unique small under-water treasure for their owners - and they should well be proud of them. Most of the other scapes have achieved well, they have my respect. 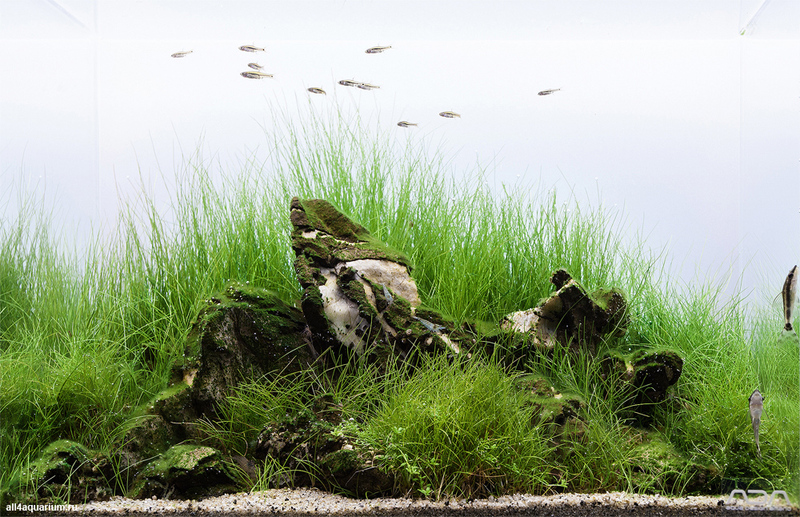 I especially congratulate to the Eastern-European aquascaping community for producing somewhat better results than their other European counterparts. I have evaluated the scapes based on downloaded images - without knowing where they come from, so my impartial geographical judgement is guaranteed. Great experience and a real honour to judge all the aquascapes, I hope to see you next year with even better and more profound creations. 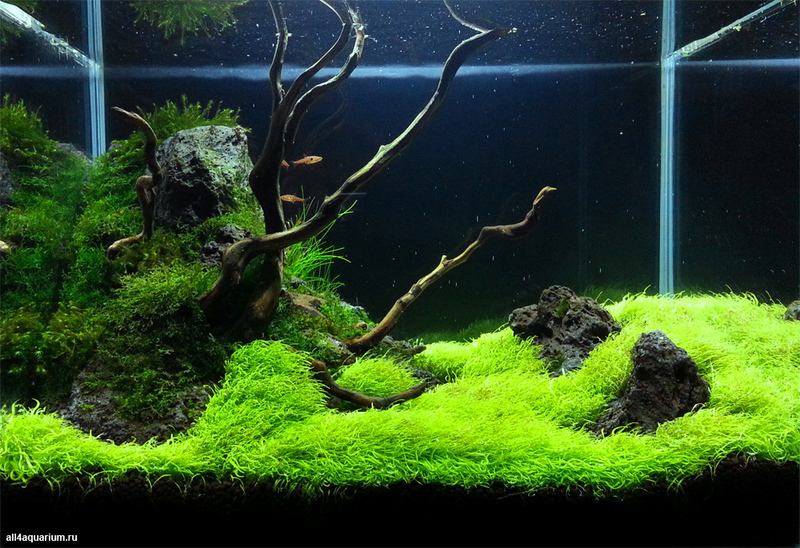 Cyrille Moresve (France): An aquascape is good, but unfortunately too trendy. Although the entry is of high quality. Oliver Knott (Germany): A real nice scape and rich of details. The roots placed wonderfully in this tank. 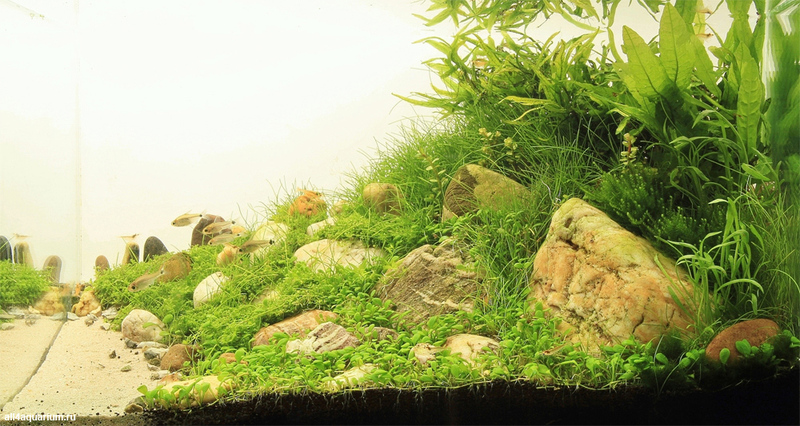 Stefan Hummel (Germany): A superbly planted and precise natural aquascape. A firework of many different plants in a magical harmony. 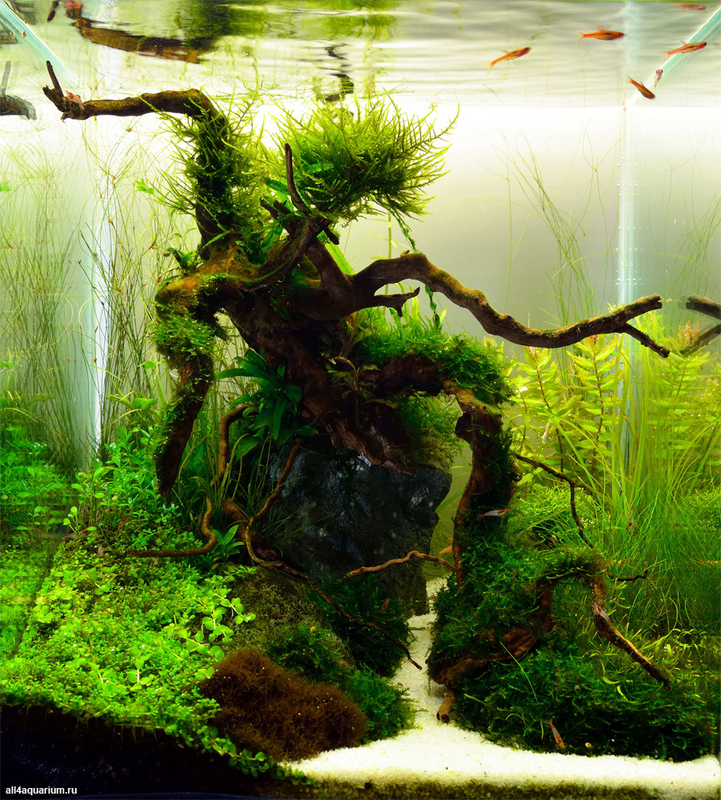 Balázs Farkas (Hungary): A two-year-old aquarium in perfect shape! This is how maintenance should be done by all. 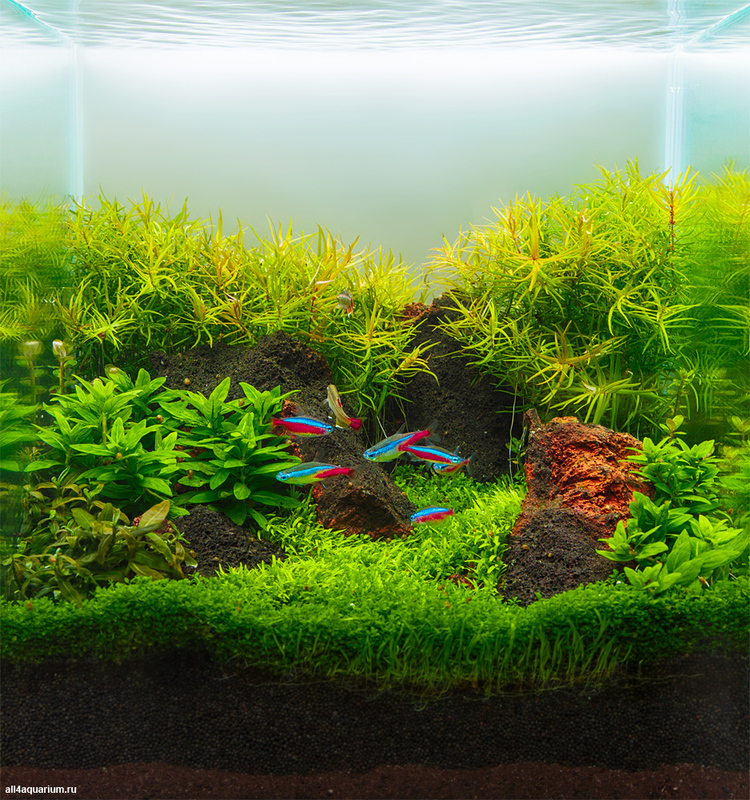 Keeping a nano tank in good condition for such a long time is a great achievement. Congratulations! Diego Marinelli (Italy): Composition is balanced and very natural, I would have added some plants in the background to complete and make it perfect. 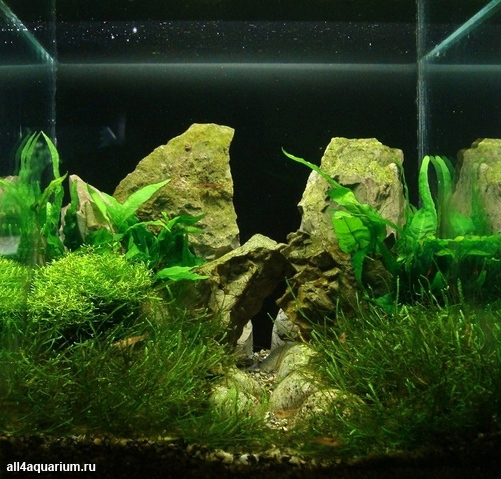 Sergiusz Kowalew (Poland): Aquarium very clean and tidy. Despite the small dimensions, managed to get the effect of depth. Deserved high position. Alex Veres (Romania): Nice planting and I like the soft, looping path. 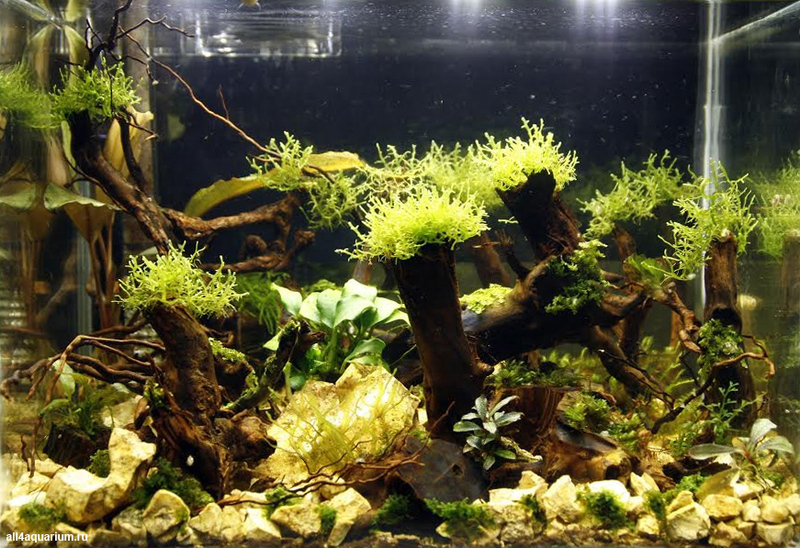 However the vertical placement of the driftwood leads the eye out of the aquascape. Serkan Çetinkol (Turkey): Good planting, good fish choice. Orange and green colours harmony is really nice. Maybe you can trimmed Hemianthus callitrichoides in front glass side. Congratulations. 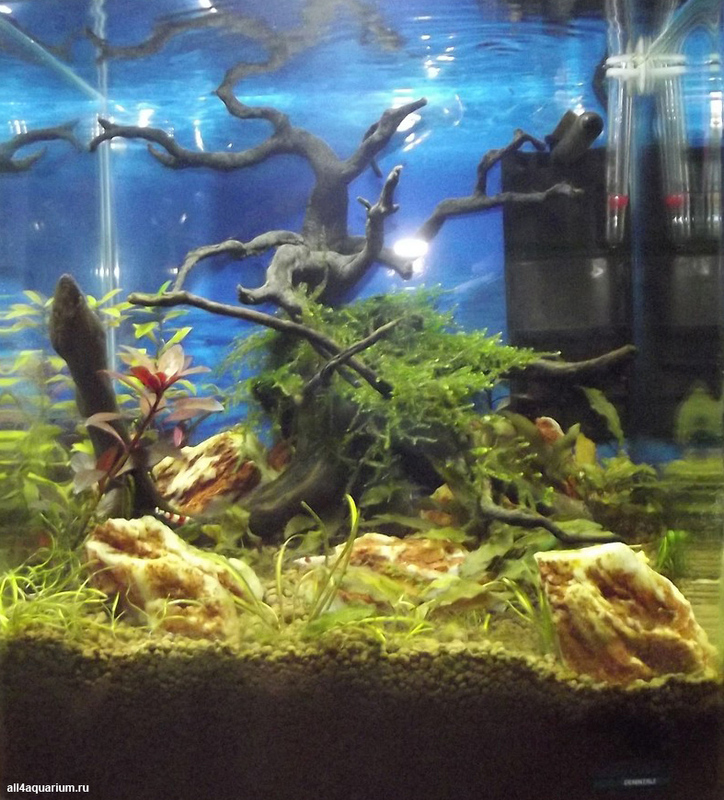 Cyrille Moresve (France): Certainly, it is the most beautiful aquarium of the contest. The structure of the hardscape and planting with this mix of colors enhanced by the photo are a pleasure for the eyes. 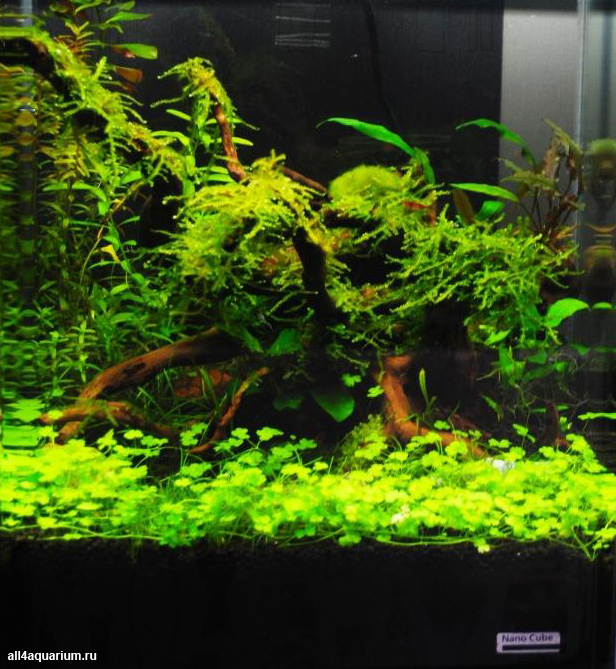 Dimitris Ioannou (Greece): Although the root is big for this tank size, you have managed to match it highly and “dress” it perfectly with the right plants. Sergiusz Kowalew (Poland): An original composition. Very good condition of the plant. Mind a little bad to compose the shot. Kim Pulkki (Sweden): Very natural feeling and good harmony. Perfect scape in a small tank. I don’t like the little branch at the surface but I like this scape a lot. May the force be with you! Alexander Grebeniuk (Ukraine): Gorgeous composition. Great trimming, excellent condition of the plants. Accurate, balanced composition. Oryzias woworae match very well to the overall design. 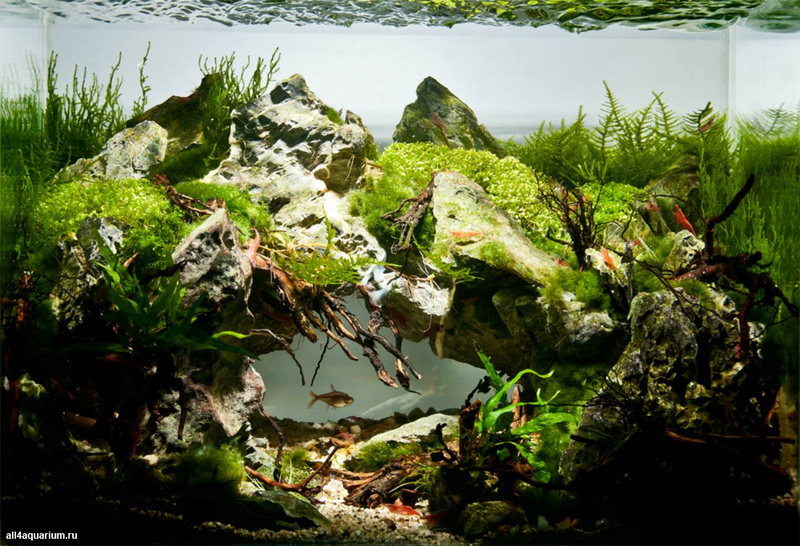 Oliver Knott (Germany): A real great rock work for such a small tank. The effect of the small parts of rock behind gives this layout a real deepness. Diego Marinelli (Italy): Wonderful and extraordinary scenery in just 12 liters. Perfect use of the rocks to give depth to the composition. Perhaps the Staurogyne in the middle confuses the perception of proportion. Alex Veres (Romania): I find the rockwork and white sand paths a little bit overwhelming. I can't take my eyes off of them to admire the healthy plants. Albert Escrihuela Cáceres (Spain): The structure of rocks is very natural, smaller rocks at the road give a sense of distance. The transitions between the front part and the rear areas are well balanced and very well done. Staurogyne leaves are too big for this tank and composition, I would choose Micranthemum Monte-Carlo or some rosette plant with smaller leaves. My points for this aquarium are 8.2 of 10. Alexander Grebeniuk (Ukraine): Perfectly selected material for hardscape. 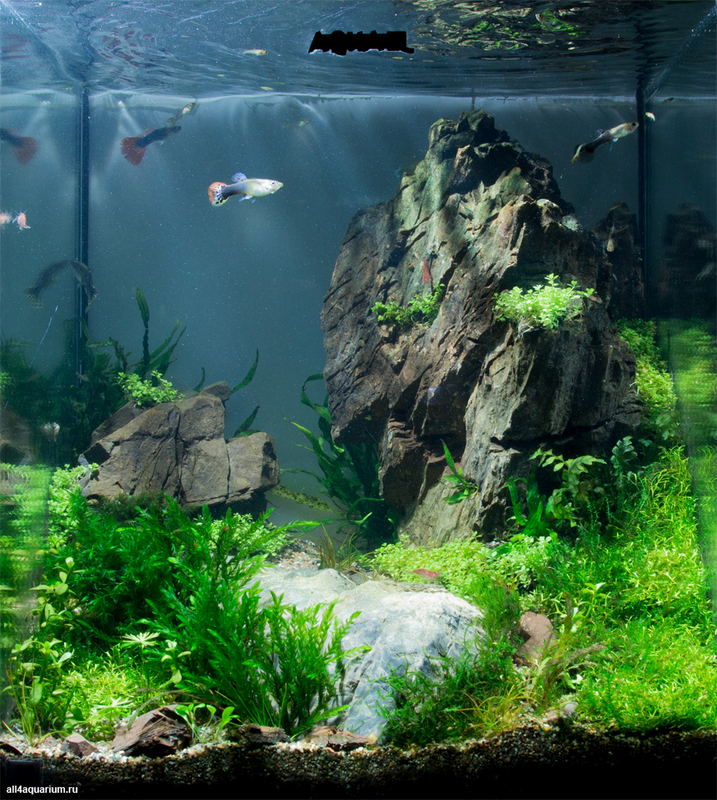 Reflections of small stones in the side glasses of the aquarium visually increase the perspective, it is usually very difficult to achieve. The use of disproportionate leaves of Staurogyne repens in this case is questionable, but there are answers in my judging points. Boraras urophthalmoides is almost perfectly selected. 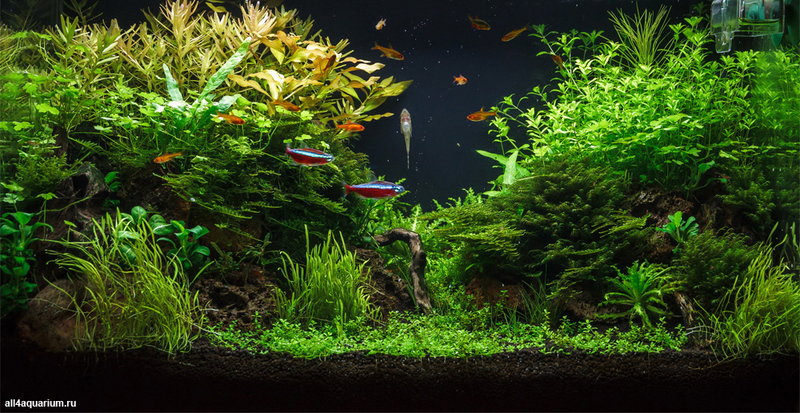 Dimitris Ioannou (Greece): You have set a very beautiful aquarium and you have managed it to look larger than it really is with the depth in your aquascape. 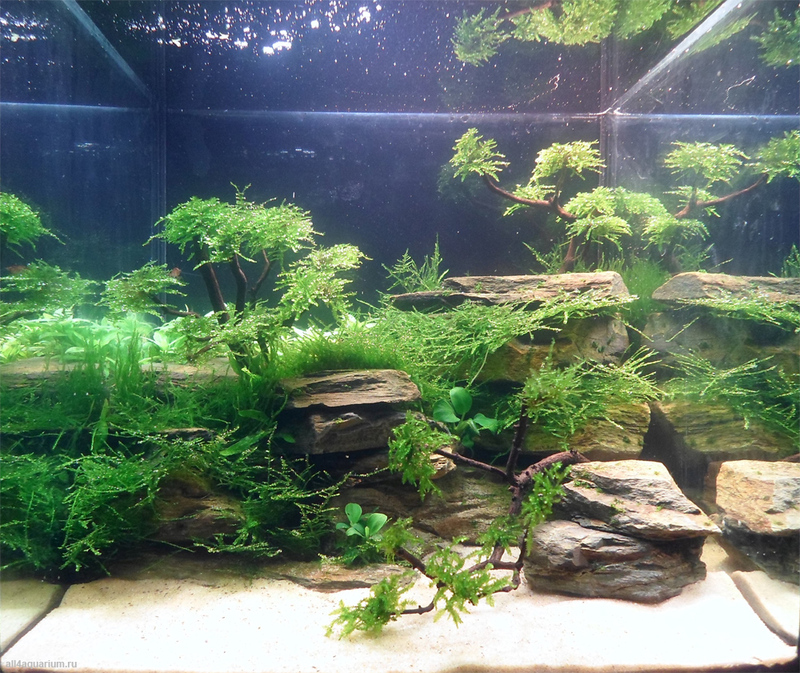 Balázs Farkas (Hungary): A great little tank, but the contest photo should have waited until the Green Spot Algae clears off the rocks, or it should have been brushed off with more care. 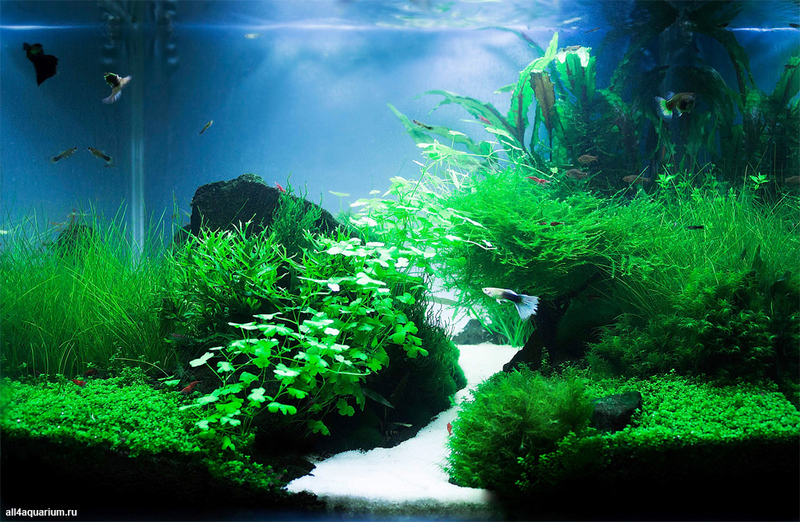 Otherwise this scape has a lot of potential, the arrangement is really good. 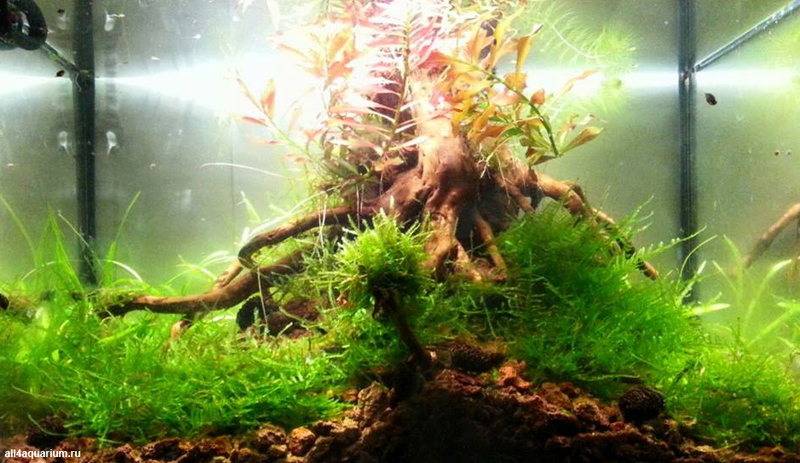 Alex Veres (Romania): Driftwoods leads the eye out of the aquascape. Still nice plant and hard scape done. 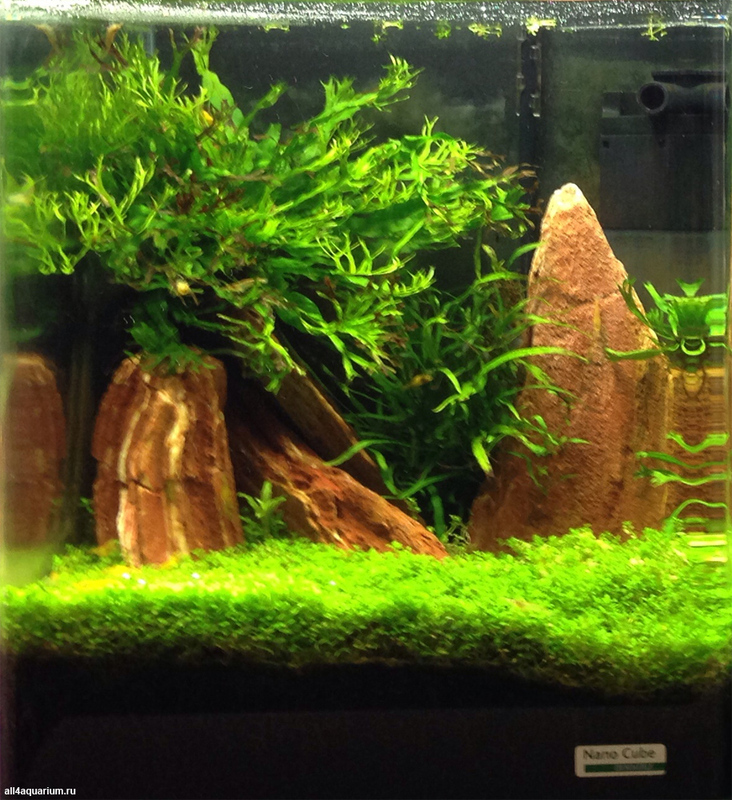 Kim Pulkki (Sweden): Great depth in this little tank. A lot of details and the right choice of plants. Thumbs up! Serkan Çetinkol (Turkey): Wonderful perspective. Planting and rock scape is intelligently to back side. Congratulations. 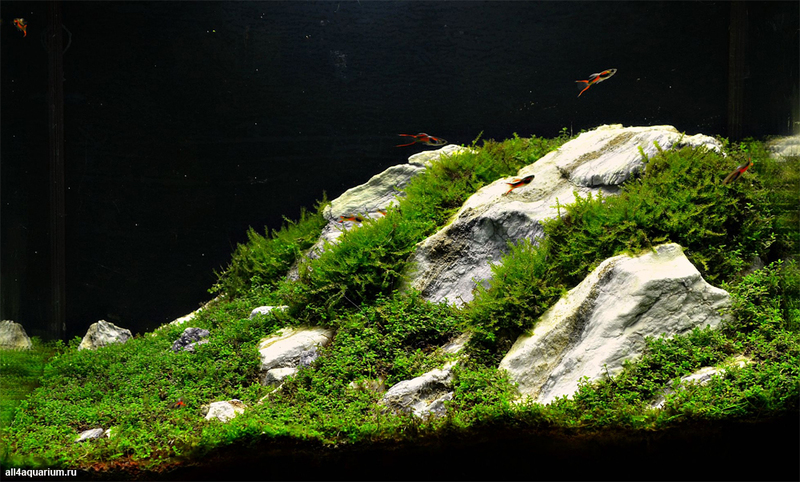 Stefan Hummel (Germany): The hardscape is perfectly done. The stones show a beautiful patina. Due to the minimalist selection of plants, the rocks come perfectly. 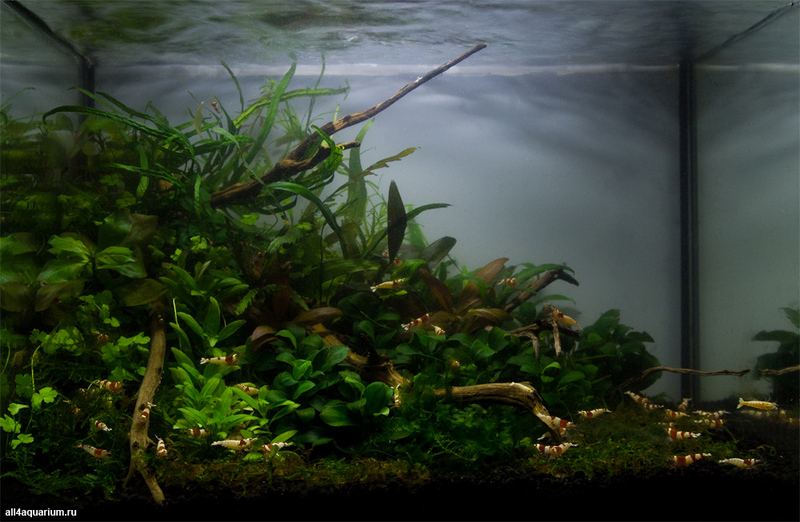 Albert Escrihuela Cáceres (Spain): An Iwagumi style is very well structured with very good choice of plants and done well, the fish are chosen very successfully, and the picture is really good. The surface of the rocks is very accomplished. 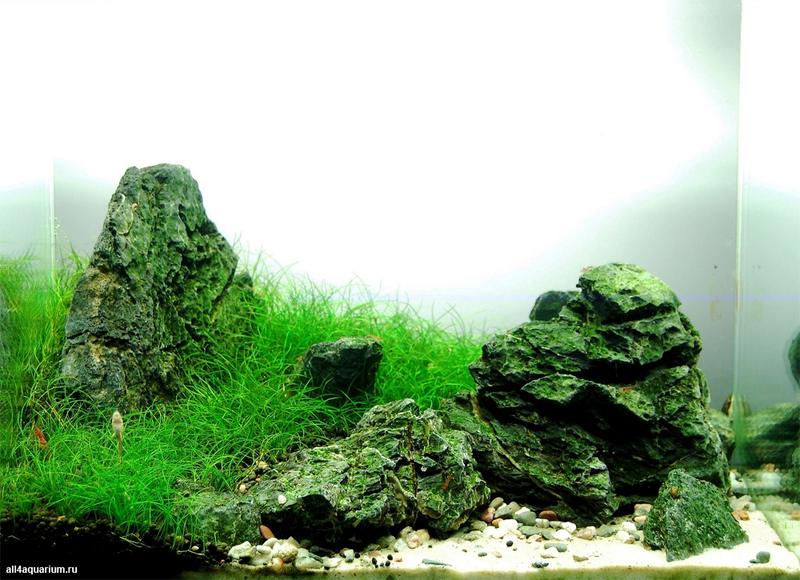 You have to try to control some algae growth in Eleocharis and on rocks. 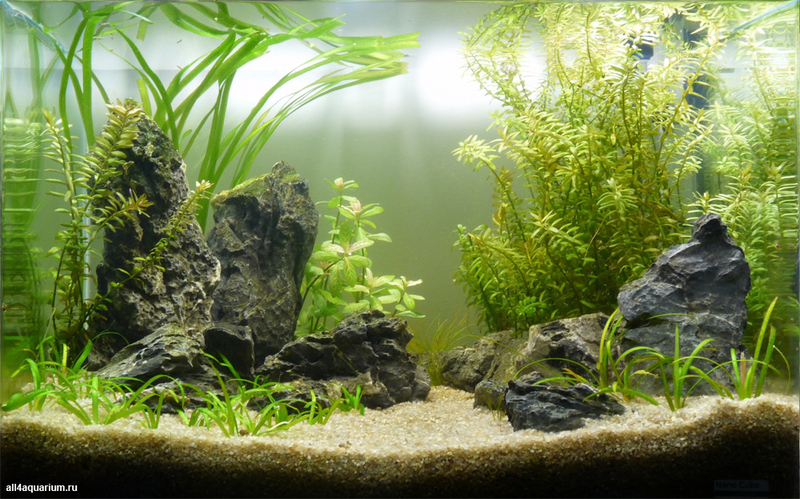 Without some plants in the front the rocks would be more prominent, so it would be a classic and beautiful aquascape. My personal points are 7.9 of 10. 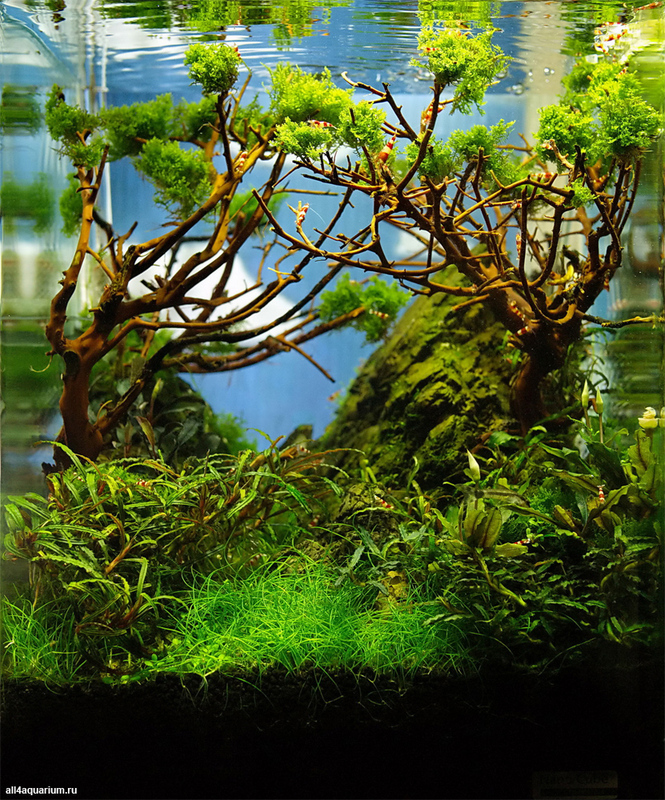 Sergiusz Kowalew (Poland): Classic iwagumi. Perfectly matched stones. From the aquarium beats peace and harmony. In my opinion by far the No. 1. 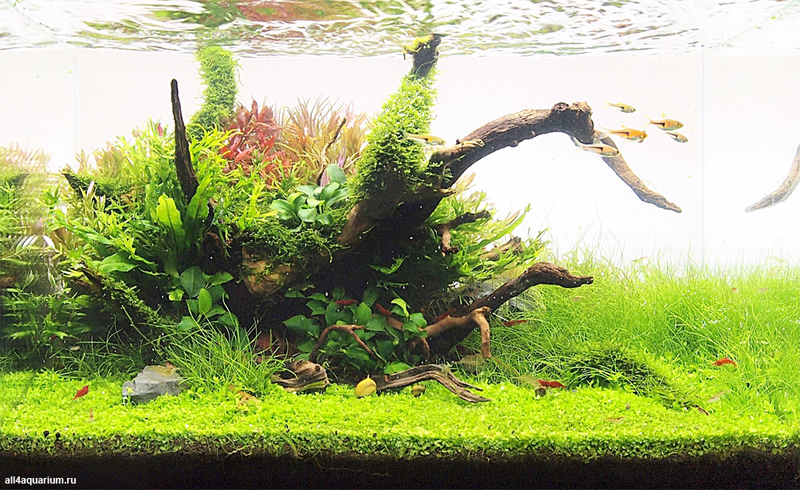 Cyrille Moresve (France): An aquarium remarcable for the density of plants and mixing colors is the first in this region. It is just a pity that the whole structure lacks of originality, and the photo quality is not as good. 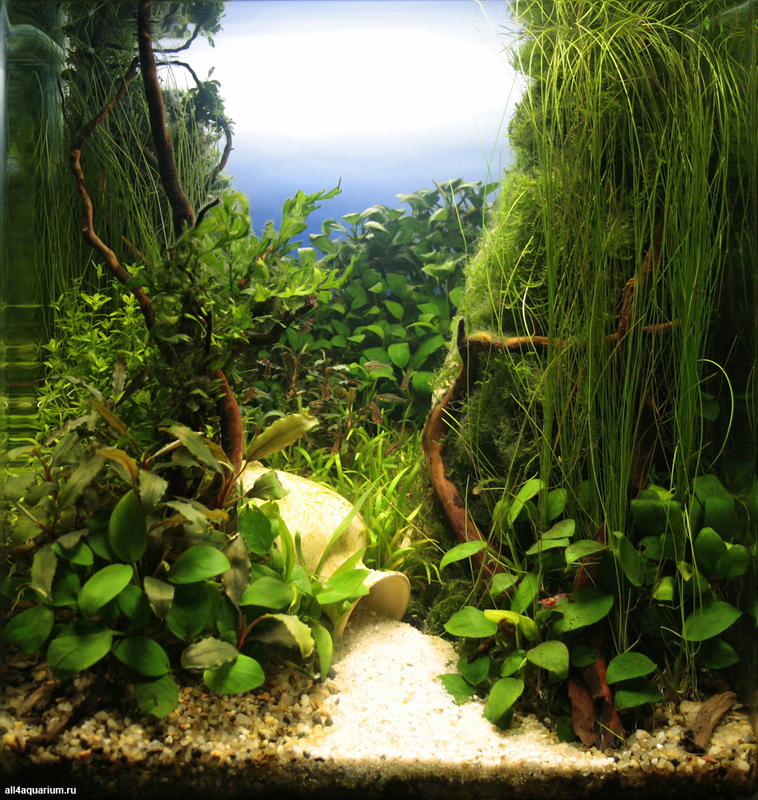 Diego Marinelli (Italy): A perfect and classic nature aquarium in a little tank. 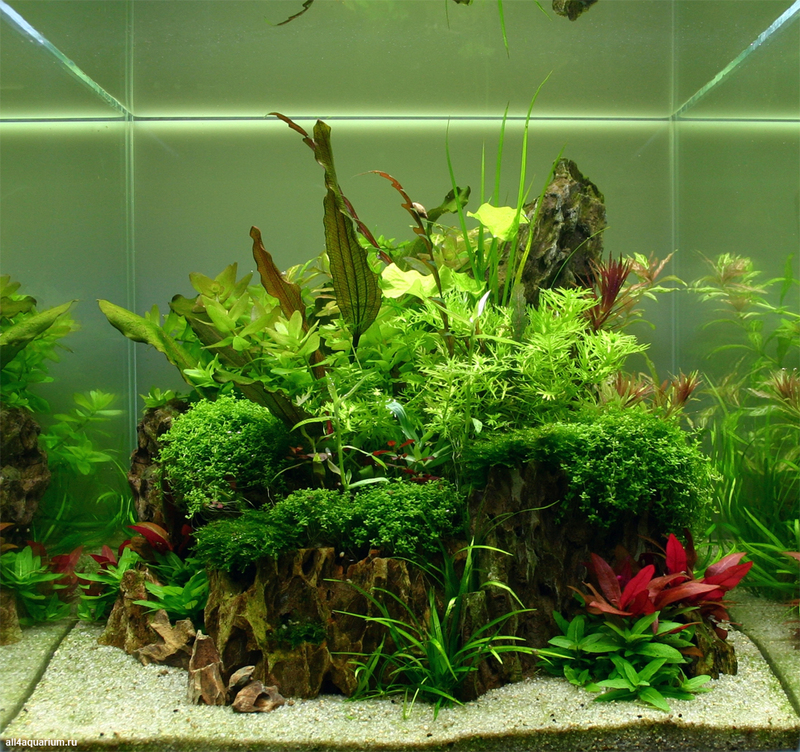 Alexander Grebeniuk (Ukraine): It is definitely the highest skill to create composition worth an aquarium of 300 liters in the aquarium of 34 liters. Neocaridina heteropoda var. 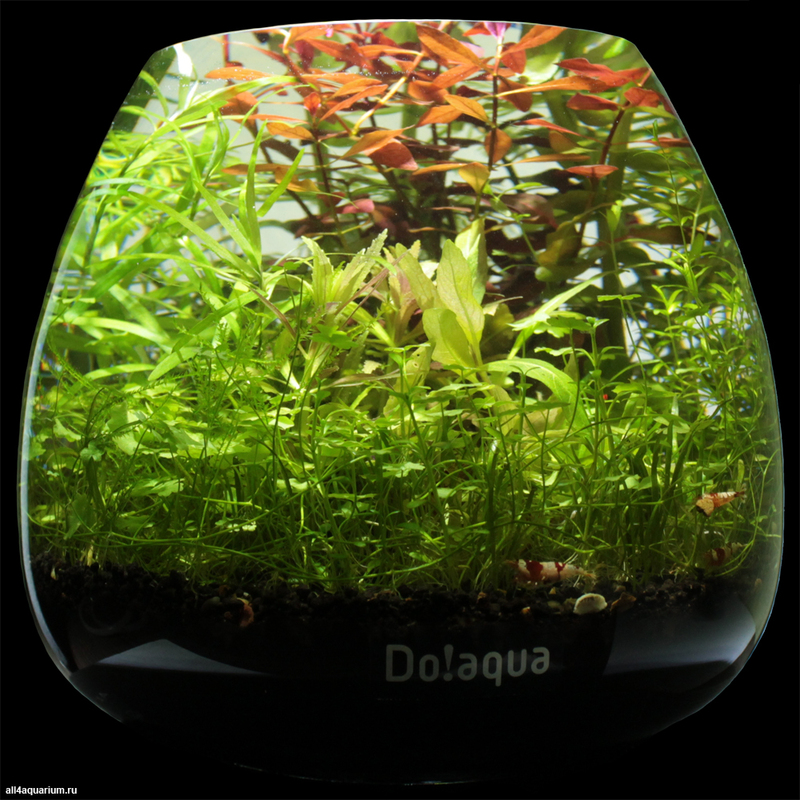 Sakura complement Ludwigia and Myriophylum mattogrosense Red, and it is a focal point of the design of variegated plants. 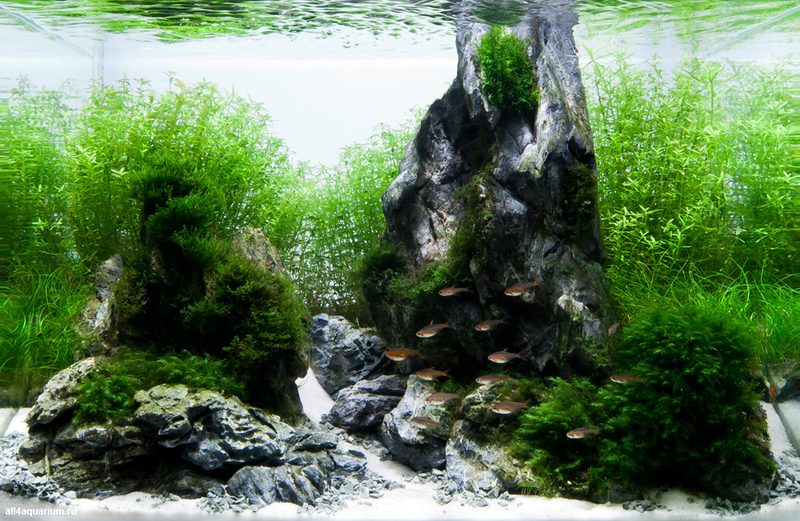 Rasbora espei looks great in a given volume and makes harmony with driftwood. 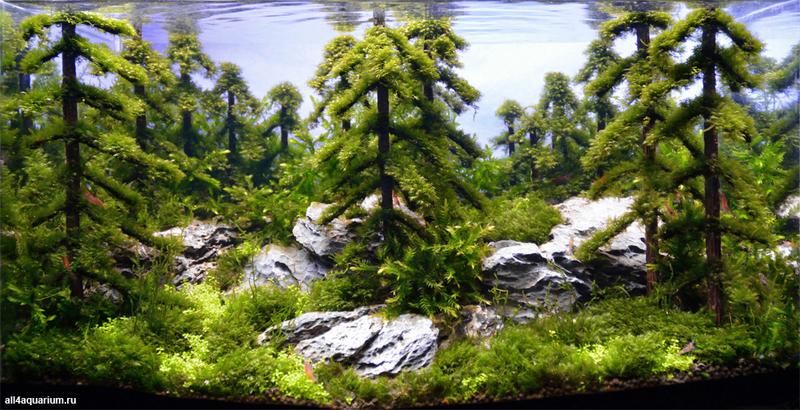 Dimitris Ioannou (Greece): Exquisite aquascape! You had a very interesting idea about the crown and your implementation is excellent. Right choice of materials, plants and a very nice photo. 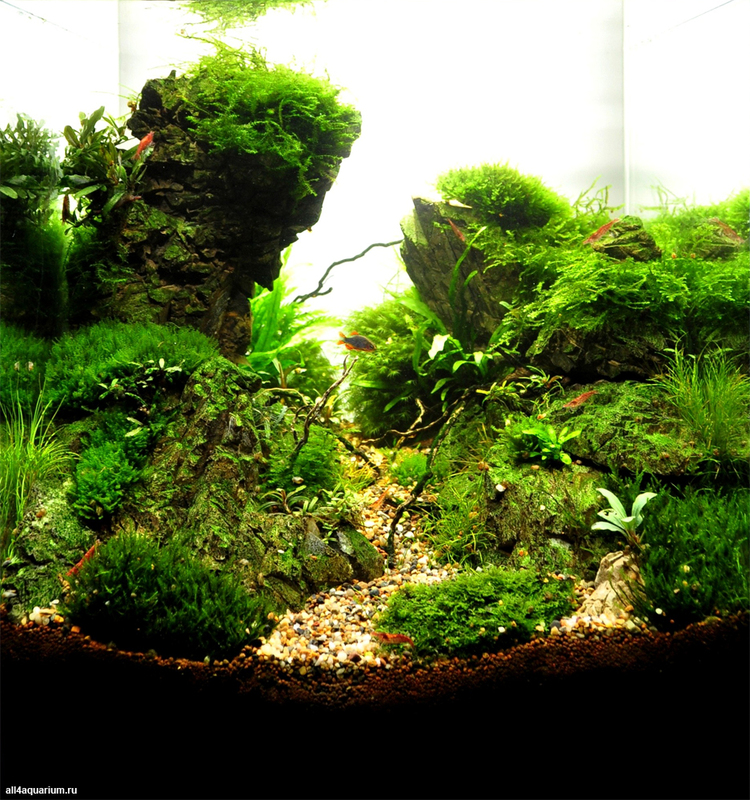 Albert Escrihuela Cáceres (Spain): The aquascape is new and very creative, the decorations are very risky and innovative. 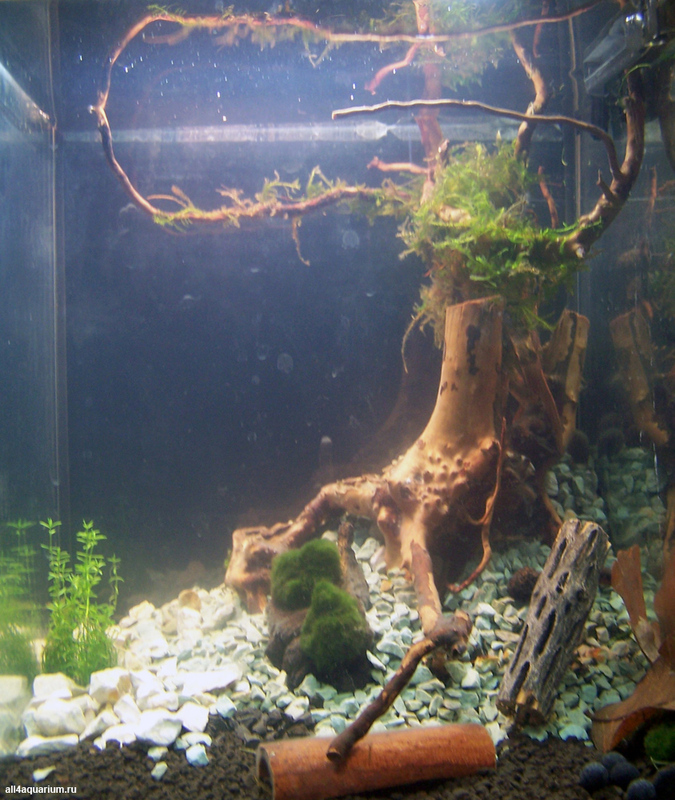 The photo is dark and the aquascape is not well visible. The effect of the driftwood between the rocks is very original and natural. 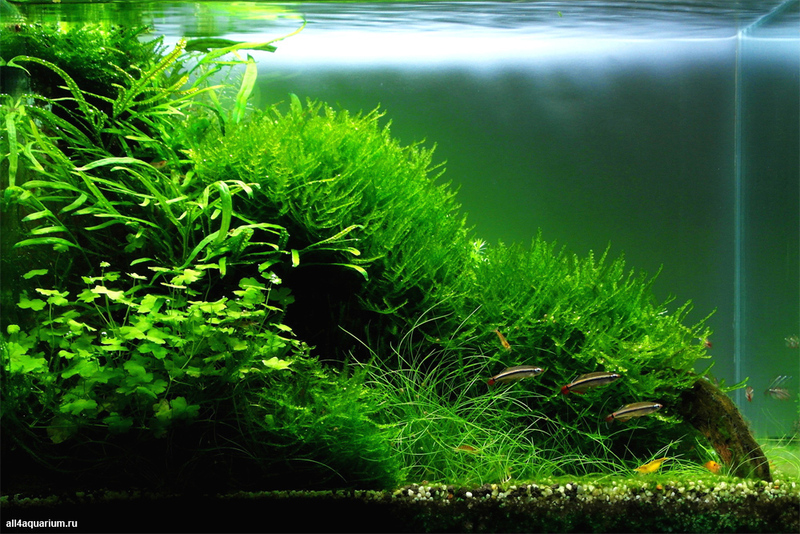 You should care of the health of some plants, and the choice of Hyphessobrycon amandae is not entirely correct, I would choose Rasbora brigitae. 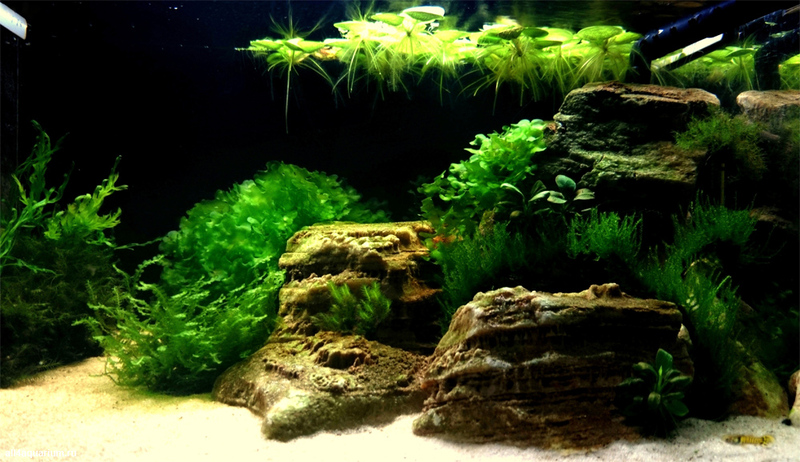 Stefan Walter (Germany): Very well done and actually stunning aquascape with fine details and well placed stones. However, the photo is not optimal, too light and does not bring out the details and depth of the scape enough. A pity. Since this is at this stage a competition judging by eyesight and photo only a good photo is essential. 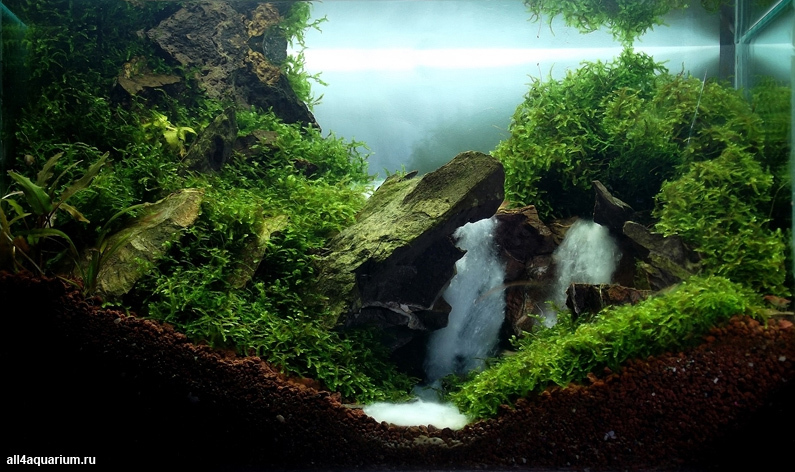 Stefan Hummel (Germany): A very peaceful aquascape with a simple stone material is done fascinatingly. Plants go very well together. 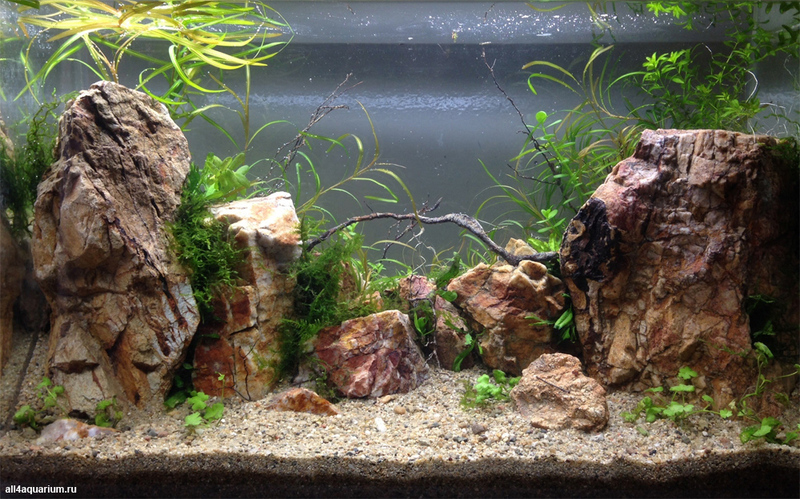 Balázs Farkas (Hungary): Great choice of fish to match the hardscape. 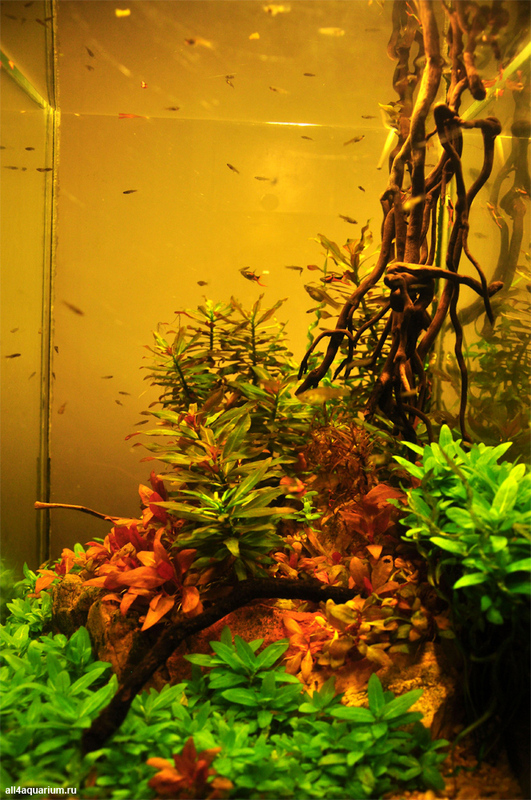 Plant health is impeccable and the yellowish color of photography greatly enhances the intended mood of this aquarium. Serkan Çetinkol (Turkey): I was very impressed, this scape bright as gold and alluring. Complicated planting looks like very natural. I just didn't want to see shrimp on the rock. Congratulations. Oliver Knott (Germany): It is like in a deep rainforest. 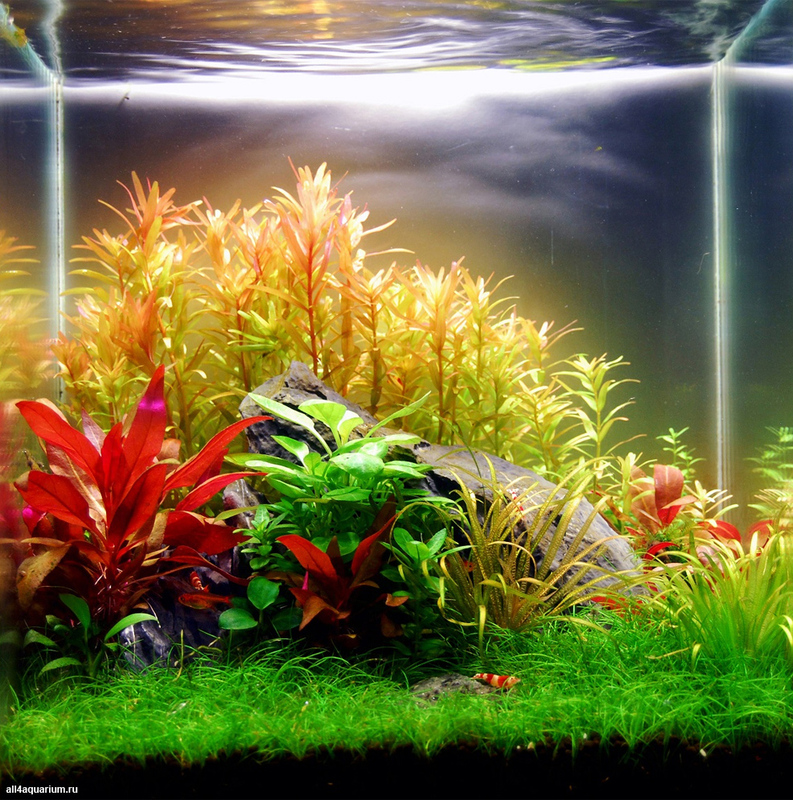 Okay maybe it is not a prefect scape but a dream for plant lovers. Stefan Walter (Germany): I like the well chosen and well placed rock(s) to create something like a little place between the rocks. I think the photo is not so good as with a better photo and a different angle more could have come out. Furthermore more filigrane work on the plants could have been invested. Kim Pulkki (Sweden): A good example of that less is more! Very good and simple hardscape. Well done! Stefan Walter (Germany): On the lower end of the scale. White pebbles questionable, arrangement of the root in the corner not so bad but the cut top uncovered spoils it all. Rest of the decoration unused or misplaced. Last not least a dirty aquarium for a photo? I would like to find out what the creator had in mind. Cyrille Moresve (France): Certainly it is the most original composition of the contest. 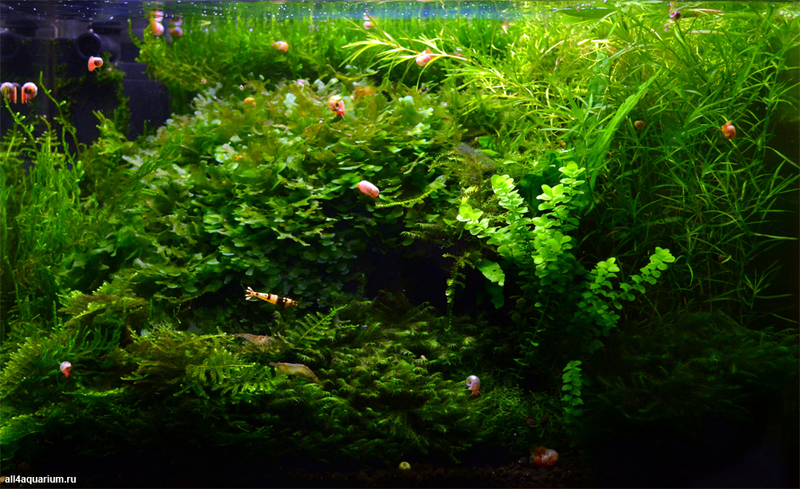 Only the quality of the photo, the bubbles on the moss and the choice of fish is not very well. Oliver Knott (Germany): Very cool and unique rock composition, great! Stefan Hummel (Germany): Exceptional hardscape with great effect. The layout was very well photographed and the fishes are perfect. Dimitris Ioannou (Greece): Whilst your setup is simple, the rock gives an identity and makes it unique. Very smart matching of this capricious rock. Alex Veres (Romania): Good job, extremely mysterious the rock. 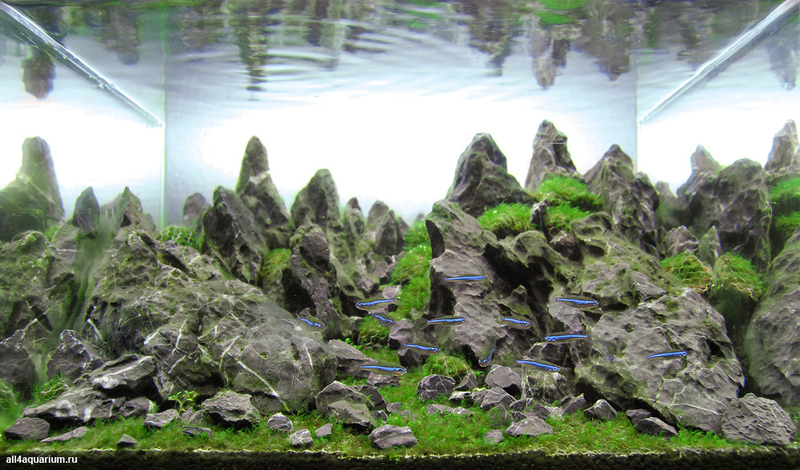 Albert Escrihuela Cáceres (Spain): Very elegant and innovative aquarium with a lot of risk because of Dragon Stone. Fishes are too big for the size of the aquarium. The plants are very healthy, and the mixture of Hemianthus callichitrioides Cuba and Eleocharis parvula is very natural and elegant. The Flame moss on top of the stones is a wise decision and it looks good. My points for this aquarium are 7 of 10. Serkan Çetinkol (Turkey): Extraordinary scape, great rock aline, crazy idea... If you add more small fish, your tank will appear biggest. Congratulations. Alexander Grebeniuk (Ukraine): For me the composition almost failed, but it earned a lot of respect for its author. If the location of the main stone of the hardscape was changed quite a bit, the very golden key in the composition could be lost. The value of this entry lies in the absolute adjustedness of all elements. 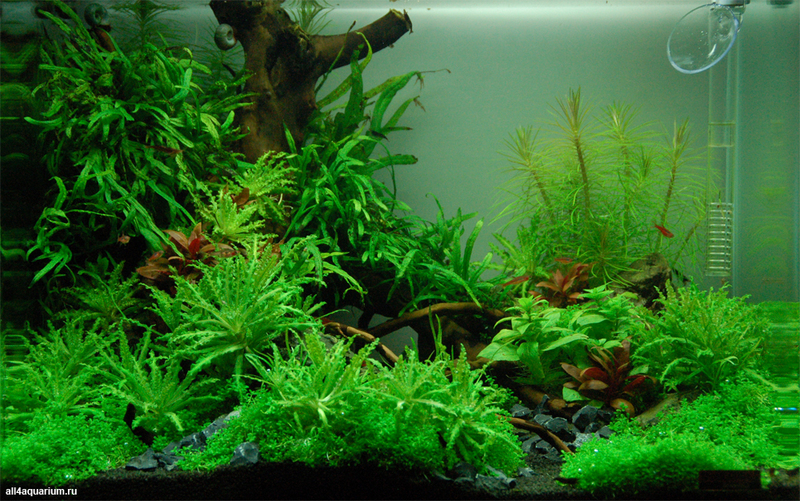 There is nothing more than the minimum selection of species of fish and plants, but the visual effect is very nice. Cyrille Moresve (France): I like the style, although it is also regular type, such as forest scape... But I like it. 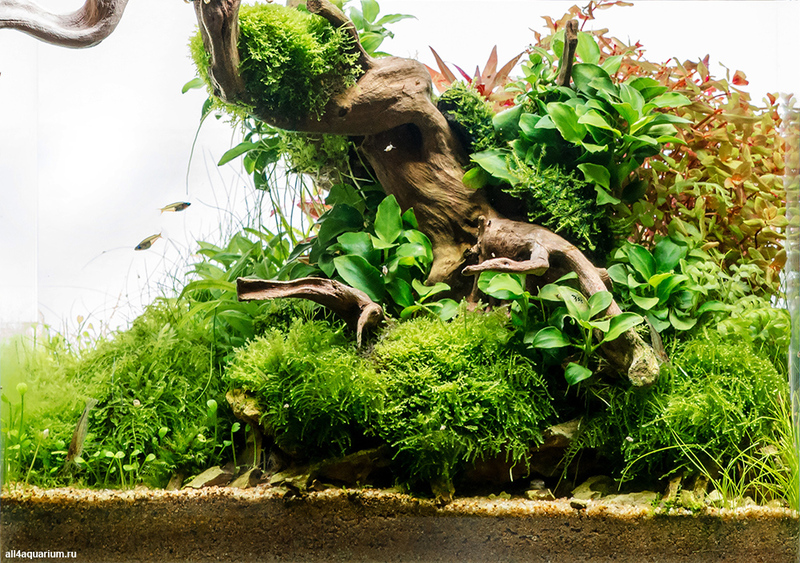 The layout is not as mature, the mosses could look more natural in the whole composition. Stefan Hummel (Germany): Imposing stone layout in the smallest space. Wow! 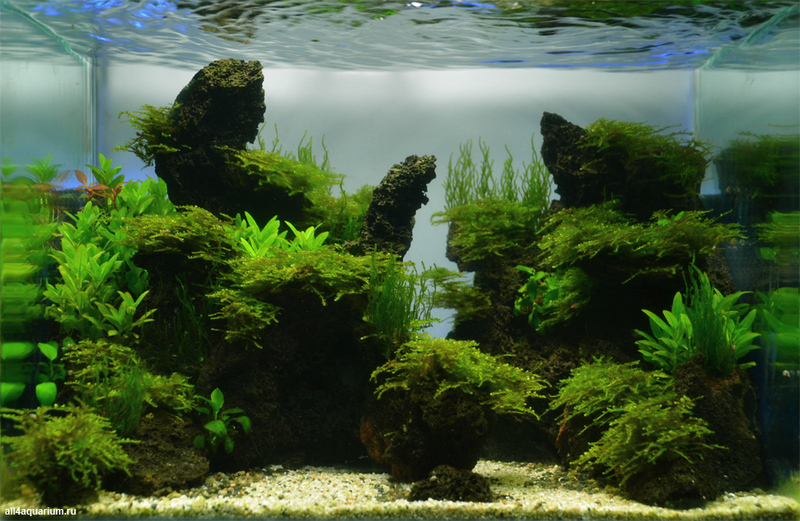 Mosses are very well trimmed and fit perfectly into the layout. 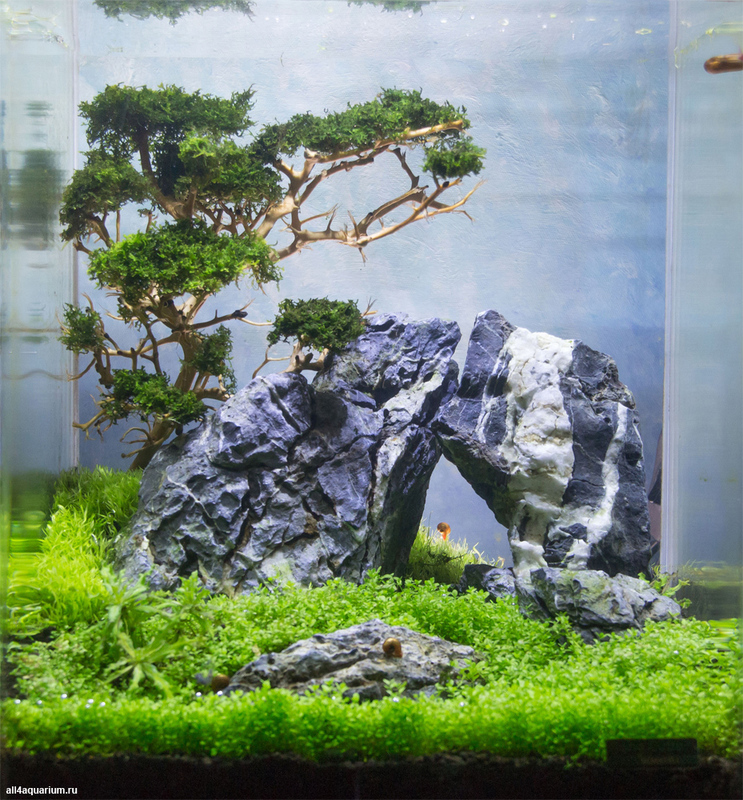 Balázs Farkas (Hungary): Superb hardscape and masterfull iwagumi composition. The sense of scale is unique in this tank. The choice of fish is also good. The photo should have waited until the GSA disappears. 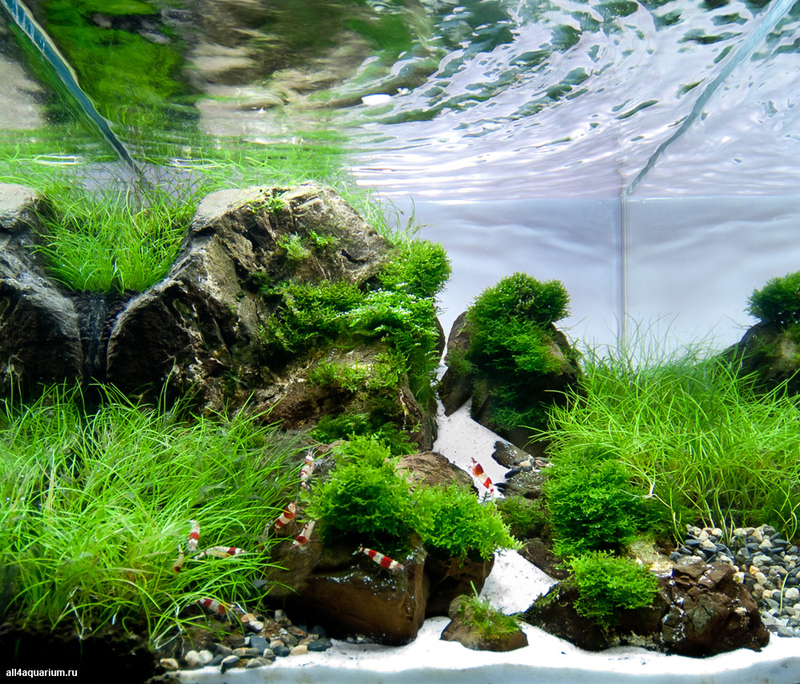 Sergiusz Kowalew (Poland): Curious and brave idea to arrange such a small aquarium. The author managed to get the desired effect. It looks good. Alex Veres (Romania): Rockwork well done. 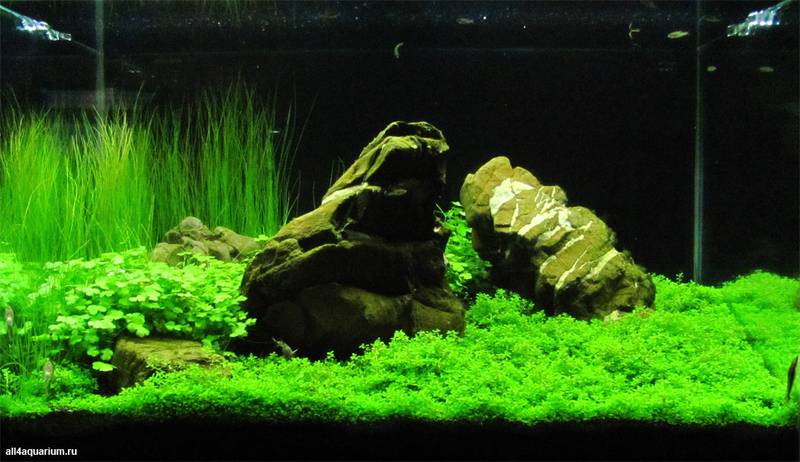 The algae that cover the rocks accentuate the sensation of natural. Nice sensation of deep for a 20 l tank. Albert Escrihuela Cáceres (Spain): The position of the rocks is very successful, and the choice of plants is very good, but the road is too straight at its beginning. 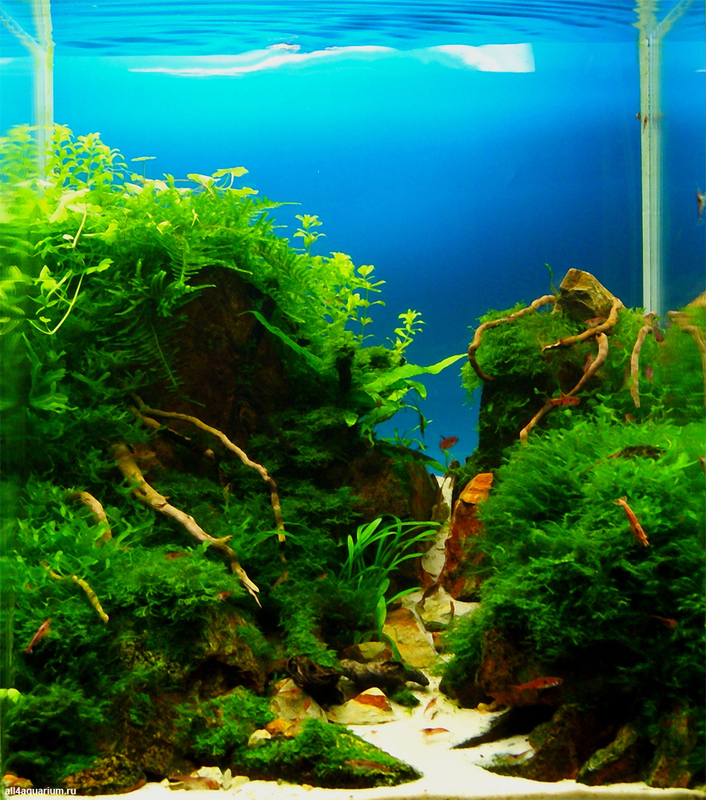 The fishes give harmony to the entire aquascape, and plants are very healthy, mosses are also very good. The white back and the photo can be improved further. My points for this aquarium are 7.4 of 10. Serkan Çetinkol (Turkey): I like that valley. Good rock texture and colour balance. Boraras appropriate for small tank, best choice. Only background doesn't look nice, maybe usable backlight. Congratulations. Stefan Walter (Germany): Beautiful choice of the root with an excellent choice and placements of the plants on the root to create tension and depth. Great lighting to provide further depth and good photo with a view to the water surface. For me just a free space missing somewhere to give the shrimps a special appearance. Dimitris Ioannou (Greece): You succeeded to create something very pretty and different in a so few space. Your lighting is great. Good effort, I like it very much. 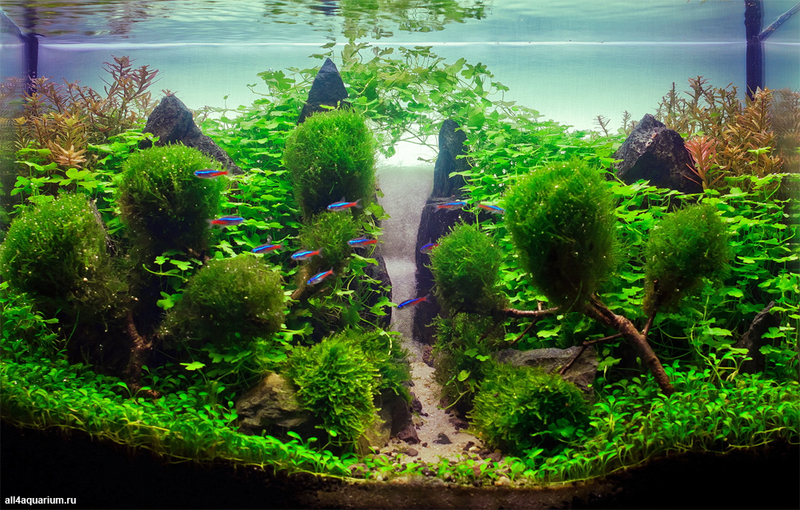 Balázs Farkas (Hungary): I congratulate the creator of my number 1 aquascape this year. The simple, yet creative choice of plants has resulted in a unique creation that is based on a well positioned and well-chosen hardscape. This intriguing composition is inviting us to step into the picture and touch the leaves. Very appealing. True masterpiece in such a small aquarium. Congratulations, you have my full respect. Alex Veres (Romania): Well done. Extremely nice and natural combination between wood and Bucephalandra sp. Definitely one of the top! Kim Pulkki (Sweden): Another great tree scape. Very good use of the volume of the tank. Great plants! Serkan Çetinkol (Turkey): I think this tank really mysterious. Rearward projecting brunches up to perspective. Congratulations. Alexander Grebeniuk (Ukraine): It is a stylish, quiet and accurate composition. 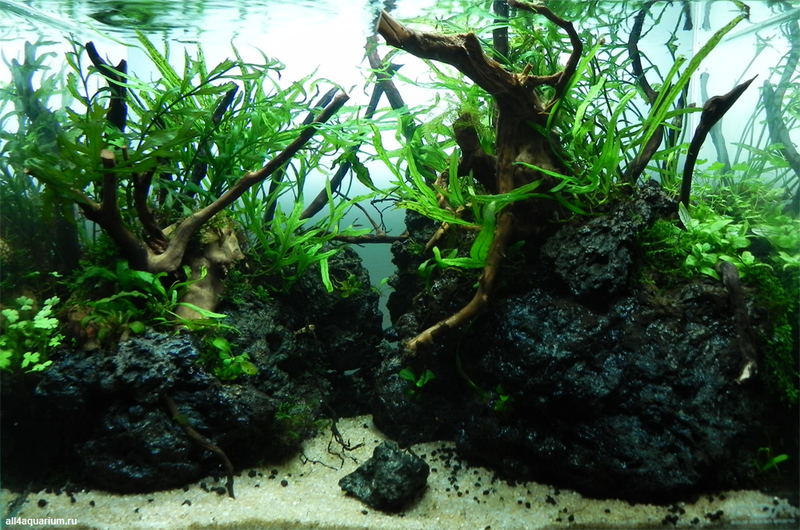 The hardscape is used very well with Bucephalandra sp. Kualakuayan. The background is chosen perfectly. Caridina cf. santonensis add to the overall picture. Oliver Knott (Germany): This scape has a very interesting effect, especially because of the photography. I love the shrimps in the trees, like monkeys. Alexander Grebeniuk (Ukraine): It is a good and interesting work. A great photographer's work should be mentioned. 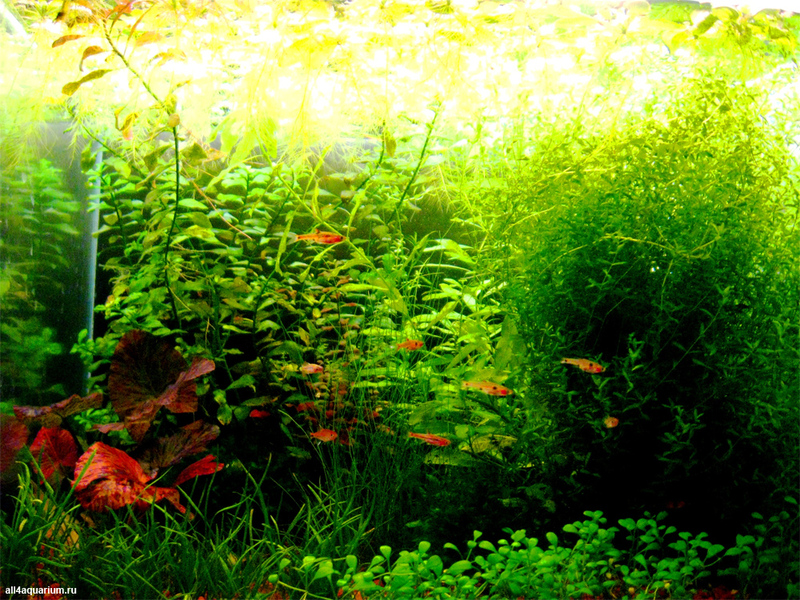 Blurring of the background and precisely located sharp arrays of Bucephalandra provide an excellent perspective. 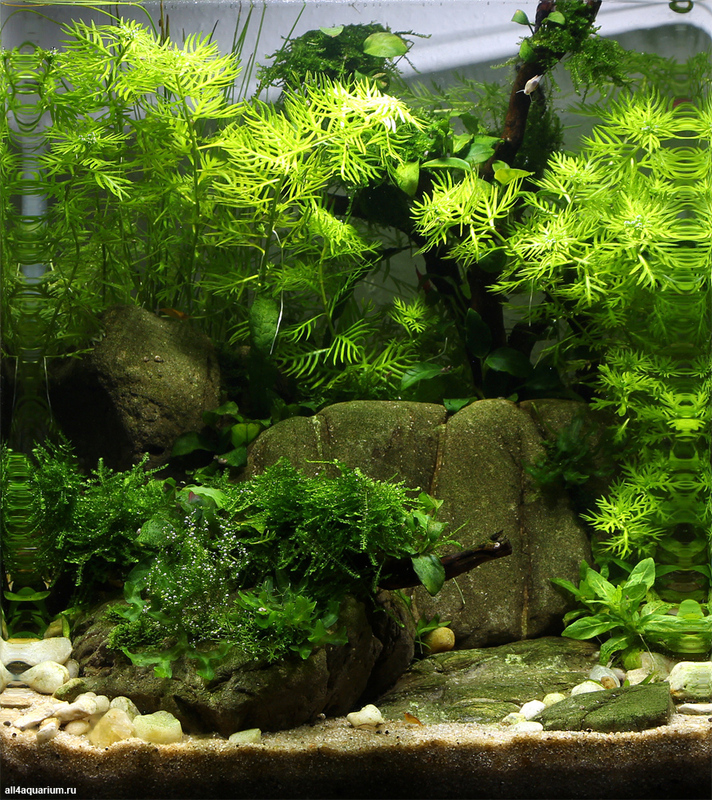 Kim Pulkki (Sweden): Small details and small plants make this tank look bigger. I like the little path going up the hill! 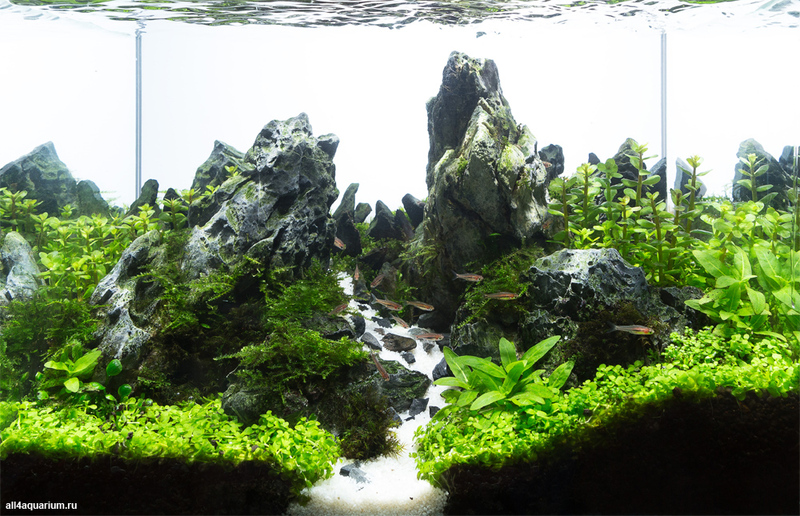 Oliver Knott (Germany): I love the white rocks in combination with the deep green plants. Very nice! 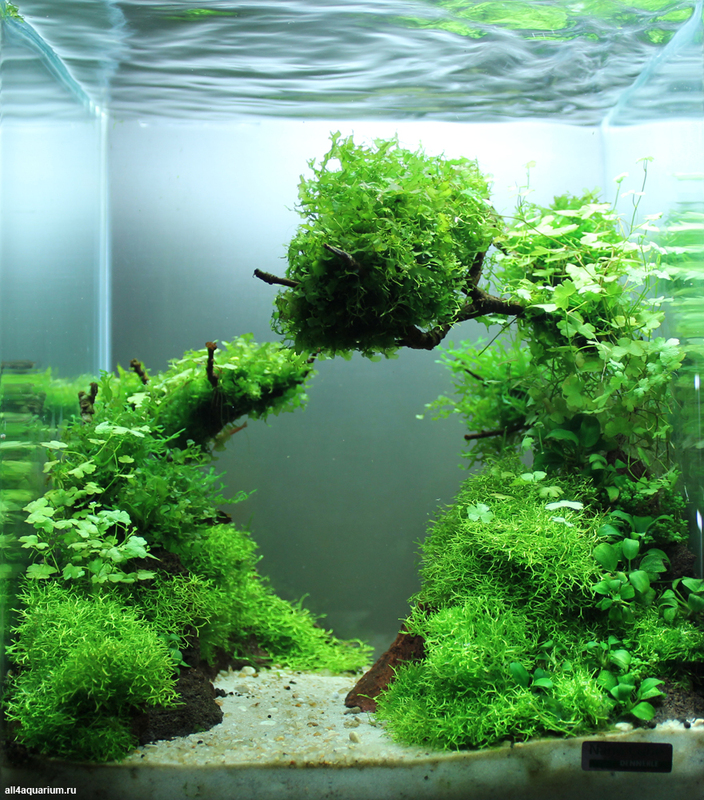 Stefan Hummel (Germany): The aquascape looks simple but is of incredible naturalness. One has the feeling to be in the Alps above the tree line. Albert Escrihuela Cáceres (Spain): A very successful composition imitating mountain climb, I think it would gain more with completely white background. Fishes look good although I would add Rasbora brigitae for example. Plants are not entirely healthy, you should work at it a little. My points for this aquarium are 6.8 of 10. 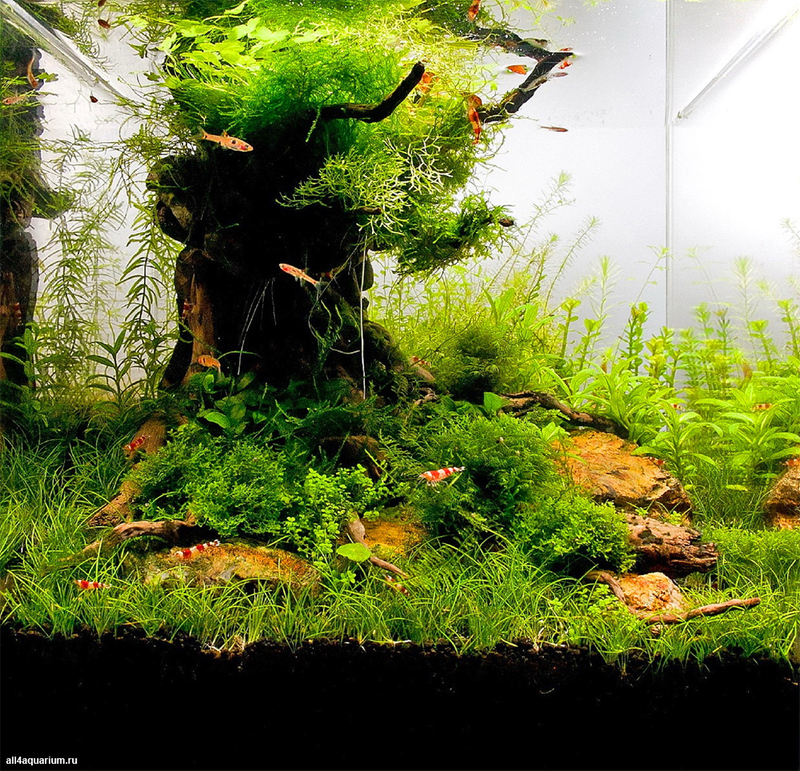 Sergiusz Kowalew (Poland): These also very interesting aquarium presented. Good idea. Had to take care of some details aquarium would be even more perfect. 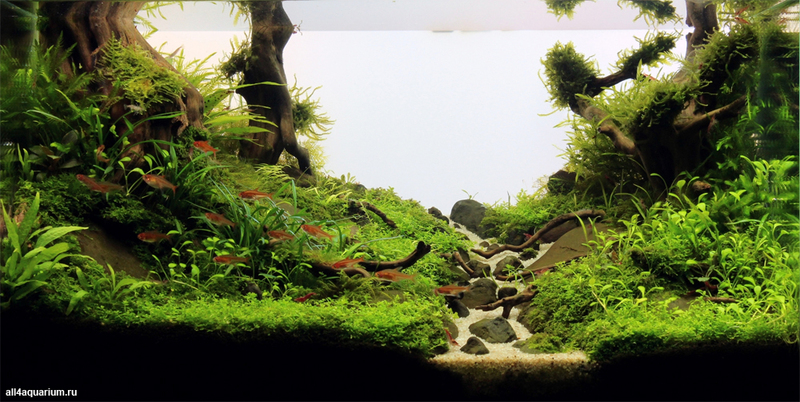 Kim Pulkki (Sweden): Very basic and simple scape, but also a very beautiful and well planned scape. Good work! 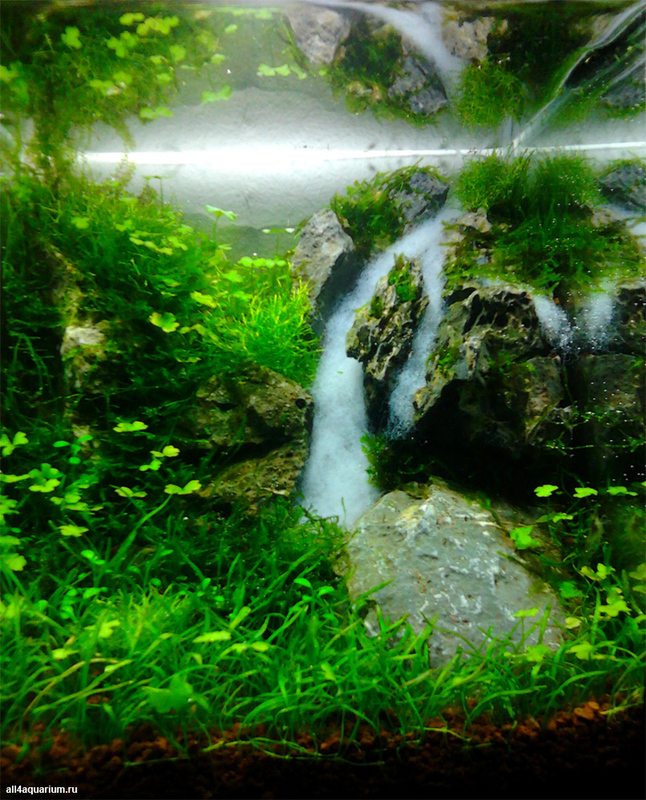 Balázs Farkas (Hungary): Perfectly crafted to create a mountain waterfall, this aquascape has a good choice of plants. The composition is very good, the whole image is very appealing to the eye. The three branches should have been chosen more carefully to give a more natural sense. Diego Marinelli (Italy): A very natural composition of epiphytic plants, great use of driftwood. Sergiusz Kowalew (Poland): A very original composition. Photography is a bit too dark. Aquarium at a very high level. Cyrille Moresve (France): A bug from my part... No, I find it kitsch but effective. The jug is to guess and it integrates well with the plants, the path... This aquarium makes me laugh: I love it. Stefan Walter (Germany): A great idea actually to use something that you would maybe find under water occasionally as a piece of junk as a main feature. However, underrepresented in this work and suboptimally carried out. Even though parts of it appear well in the photograph some more lighting adjustment would have helped and detail work on the plants as well. Possibility for development. Stefan Walter (Germany): A dramatic scape! Great placement of the rocks and good choice of plants. The photo is unfortunately not well done even though on the right side there is some good effect. The rock in front does not come out well. I am missing an option for my imagination where the gap between the rocks would lead to… The story behind cannot continue, the clue is missing. I would have also chose other fish. Cyrille Moresve (France): It is simple and effective, but I don't agree with choosing Cladophora, which is added at the last minute. 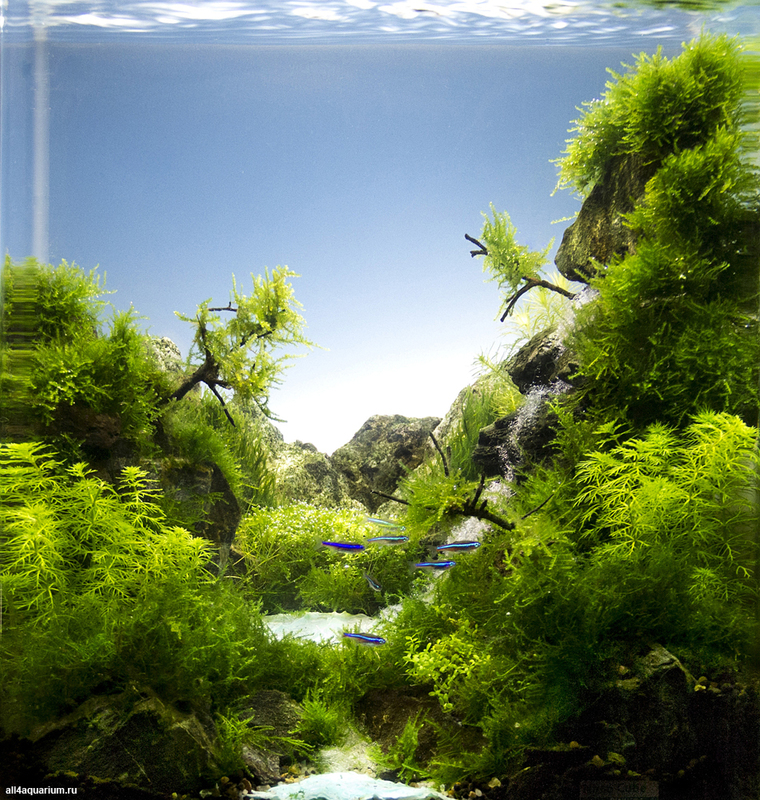 You lost all perspective of the aquascape. 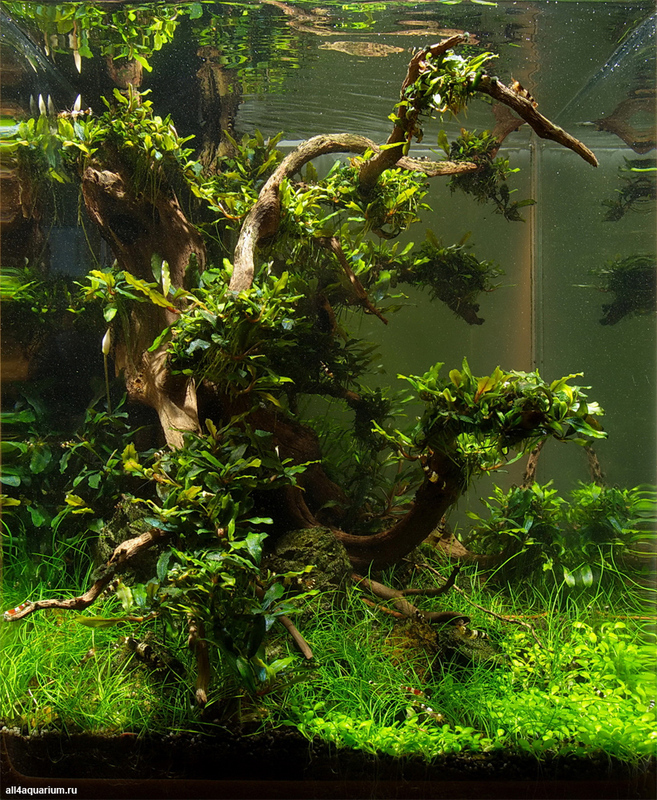 Stefan Hummel (Germany): A masterpiece in aquascaping. The natural design with Aegagrophila here is incredibly well done. The mountains are fantasticly represented in the smallest space. 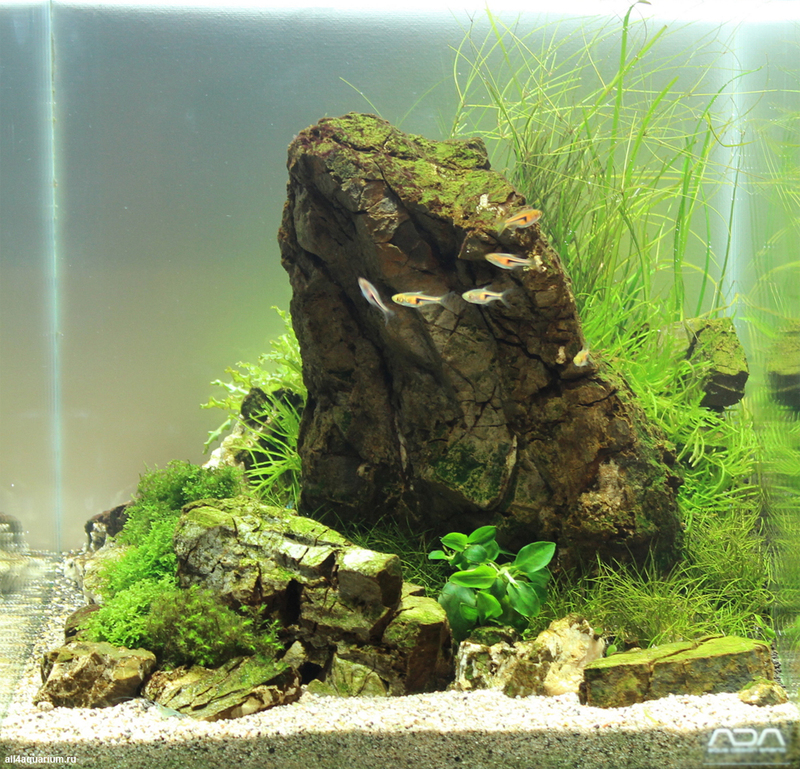 Dimitris Ioannou (Greece): If you have created such a complete setup in only 20 liter, I would like to see what you can manage in a tank with bigger volume. Well done! Sergiusz Kowalew (Poland): Great landscape. Aquarium appears to be greater than in reality. It was possible to work on the first plan. Overall, the aquarium of the highest caliber. 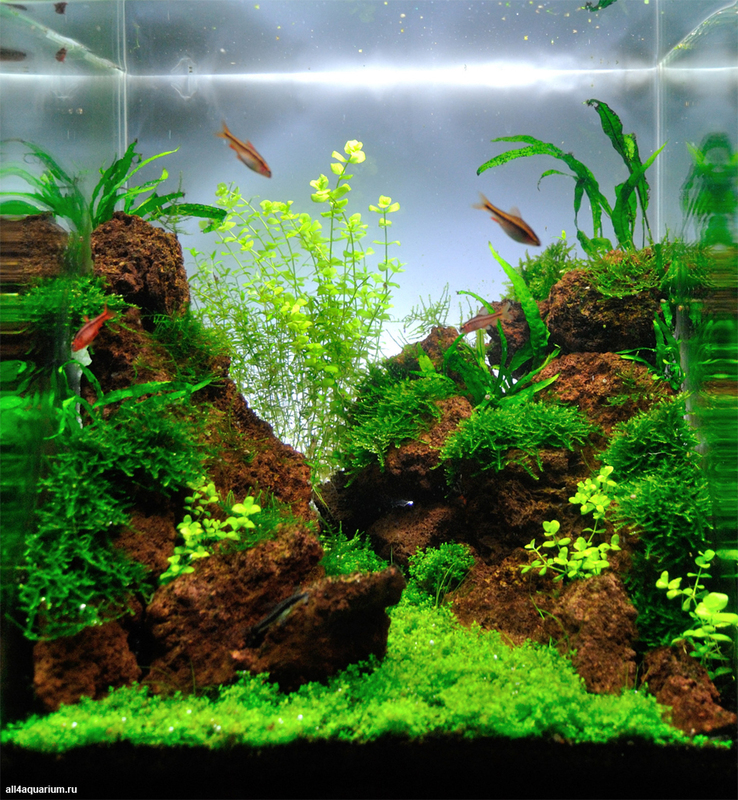 Alex Veres (Romania): Such a lovely tank with a great sensation of depth. 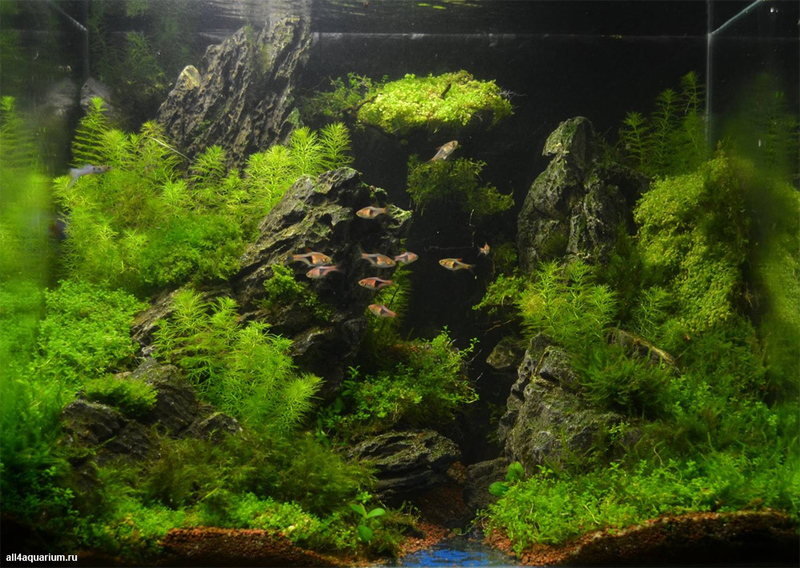 Albert Escrihuela Cáceres (Spain): The main rock is very successful as a mountain, and the trees are well integrated into the aquascape, but the whole layout lacks depth, the fishes are fine, and the photo is very good. My personal points are 7.5 of 10. Serkan Çetinkol (Turkey): I like this style, this is a landscape. Mountain effect and background highly compatible. Congratulations. 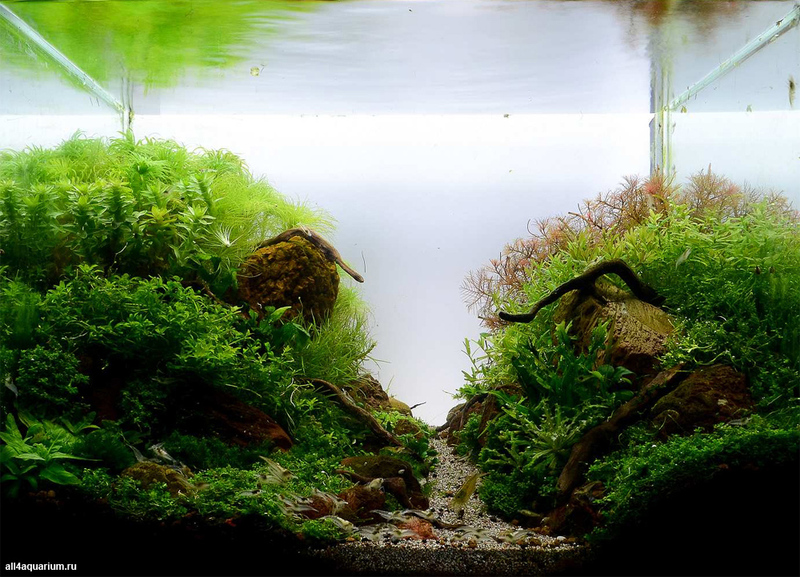 Alexander Grebeniuk (Ukraine): Great scale and perspective are created in a 20 liter tank. The transition from the foreground to the background made by the author is very interesting. It looks like the viewer stands on the edge of the gorge and sees mountain peaks far ahead. Oliver Knott (Germany): A symphony of rocks. Real amazing effect. Stefan Hummel (Germany): The world of mountains in miniature! 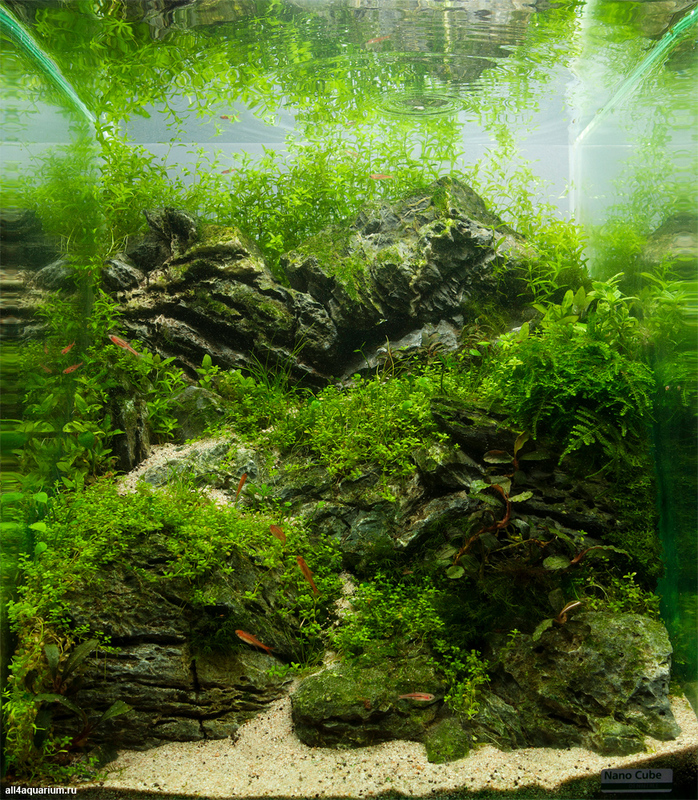 Impressive mountain aquascape, but the plants need a few more weeks to have an optimal effect to the aquascape. Diego Marinelli (Italy): Beautiful rocky scenery from the great depth... A composition of the great impact treated in detail. Albert Escrihuela Cáceres (Spain): The choice and placement of the stones is very good, a sense of depth in the back is achieved well. The photo is not good, it is blurry, and plants need a little more green. The choice of fishes is very good for this composition. My points for this aquarium are 7.7 of 10. Sergiusz Kowalew (Poland): An interesting effect. Composition is well balanced. You can see that the aquarium is still in puberty and still take some time to be fully completed. 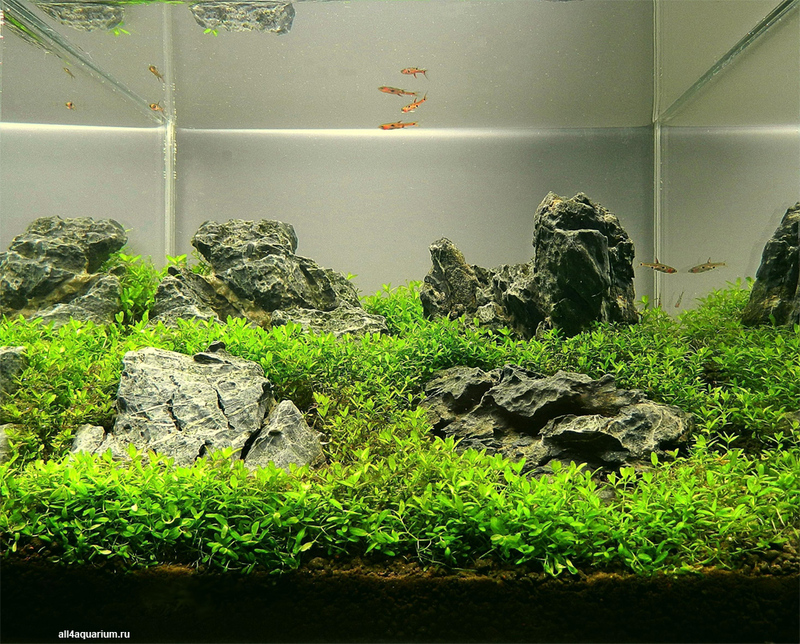 Kim Pulkki (Sweden): Too bad this scape is too fresh, because the hardscape is great. Maybe a little problem with algae is visible. Great depth! Alexander Grebeniuk (Ukraine): It is a great mountains in 23 liters. Beautifully placed hardscape with only Fissidens fontanus creates a real natural atmosphere. It was very difficult in this case to choose fishes. And the author's decision to use Paracheirodon simulans is quite successful. 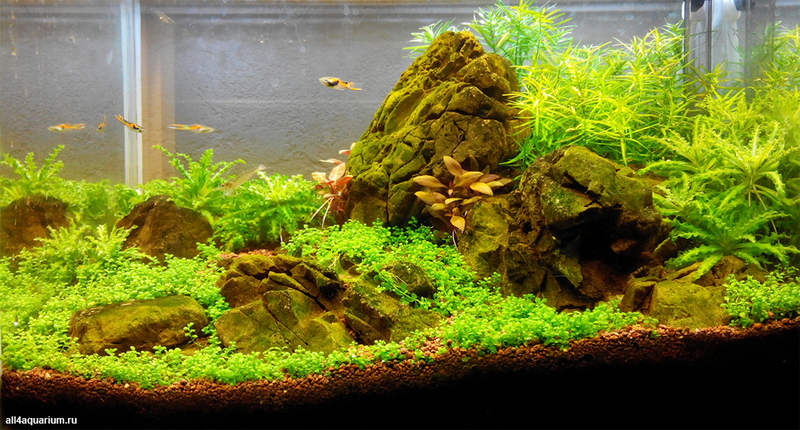 Cyrille Moresve (France): It is the first in my rankings in this region, because the hardscape, plants and the picture are nice. Although it is great shame to choose this variety of Anubias. I would choose either nanos or other plants. Oliver Knott (Germany): A great combination of woods and sand. Also the layout looks extreme deep. Congratulation. Balázs Farkas (Hungary): This is the most japanese creation of all 2014 entries. Clear and precise, well designed and good plant positioning. A small piece of real treasure. A true Nature Aquarium. Sergiusz Kowalew (Poland): Excellent use of wood as a decorative element. Photography of an excellent standard. The composition is coherent and harmonic. Rightful place. Alexander Grebeniuk (Ukraine): Strict minimalism and perfectly placed elements of the composition. With all the massiveness of the used driftwood the composition is light and airy thanks to the designer's skill. Great trimming of moss on driftwood. And successfully photographed Danio margaritatus deserve attention, because it is quite difficult to do. Dimitris Ioannou (Greece): The representation of the gorge is very good. Your plants seem to be in a very good condition and their grooming is great. Good background lighting. Alex Veres (Romania): Maybe recently trimmed but still love your combination of some not so common plants e.g. Tonina. 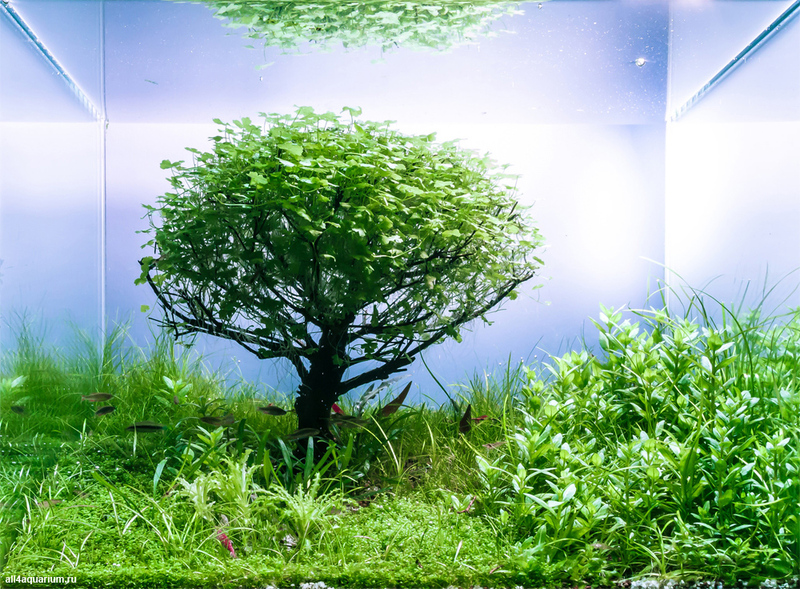 Oliver Knott (Germany): This tree is one of the best ever I saw, especially because of using a very different plant for it. Very cool! Stefan Walter (Germany): Well performed. An apple tree in a garden. Good choice of materials and plants and a great creation of the apple tree. I am missing a bit the perspective and depth in the scape. Again the photo, though beautifully arranged, is not optimal as the corners of the aquarium are visible and cutting down the depth of the picture. Really too bad. However, compliments on a very good idea. Balázs Farkas (Hungary): Nicely crafted tree, refreshing to see the perfectly trimmed hydrocotyle. 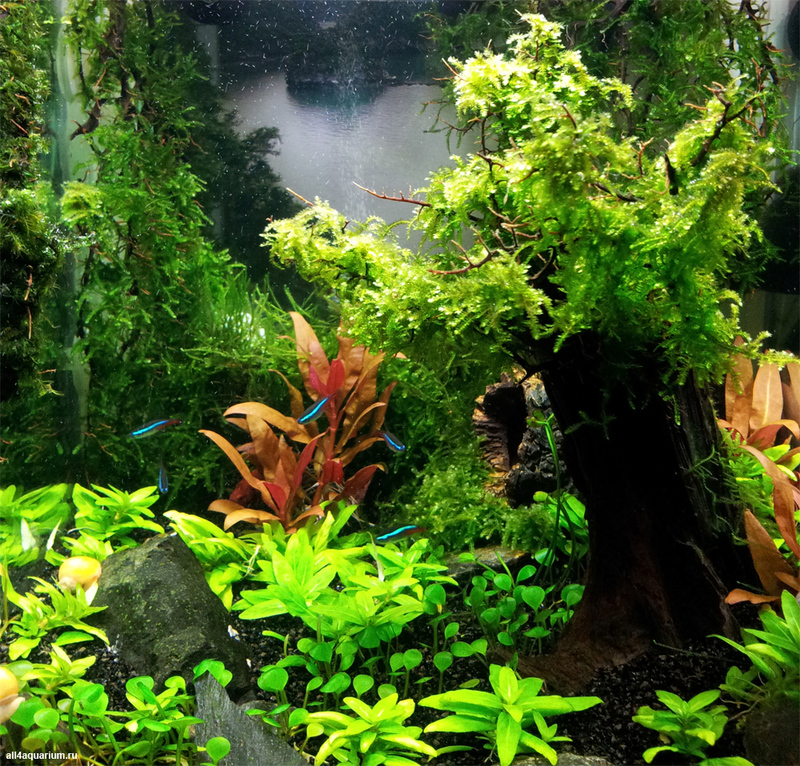 The scape lacks originality, but the attention of the creator towards details and the good choice and health of the plants has made it a remarcable creation. Serkan Çetinkol (Turkey): Japan idea is very original. Your tree seems lifelike. Congratulations. Stefan Walter (Germany): Ha! Not a new idea and apart from the trees well done. The trees sadly direct their branches downwards and ALL of them. Such a good placing of the rocks and natural landscape scene and such unnatural trees. Sorry but it spoils it all. Albert Escrihuela Cáceres (Spain): The trees are very original and it was absolutely right to play with their size to gain more depth. 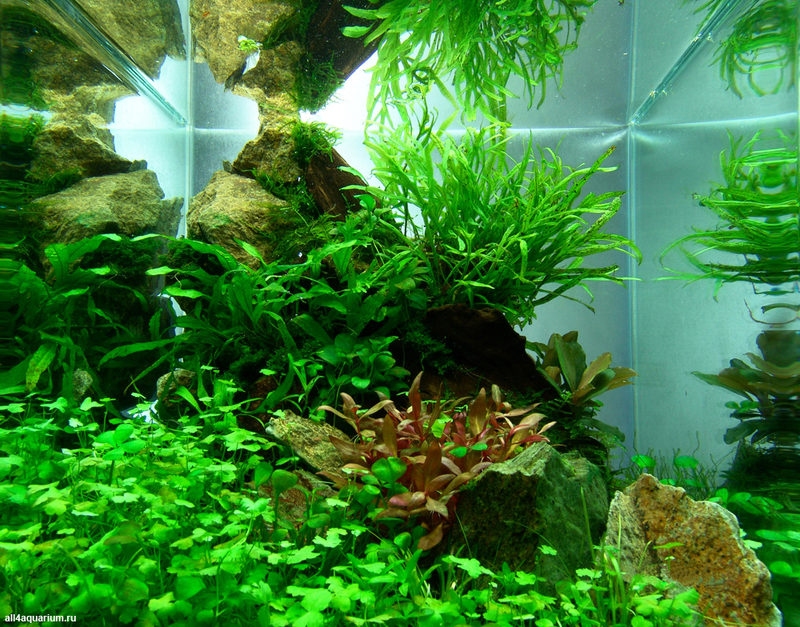 I would improve the definition of the plants above and mosses, they are very mixed and loose in the aquarium. My points are 7.4 of 10. 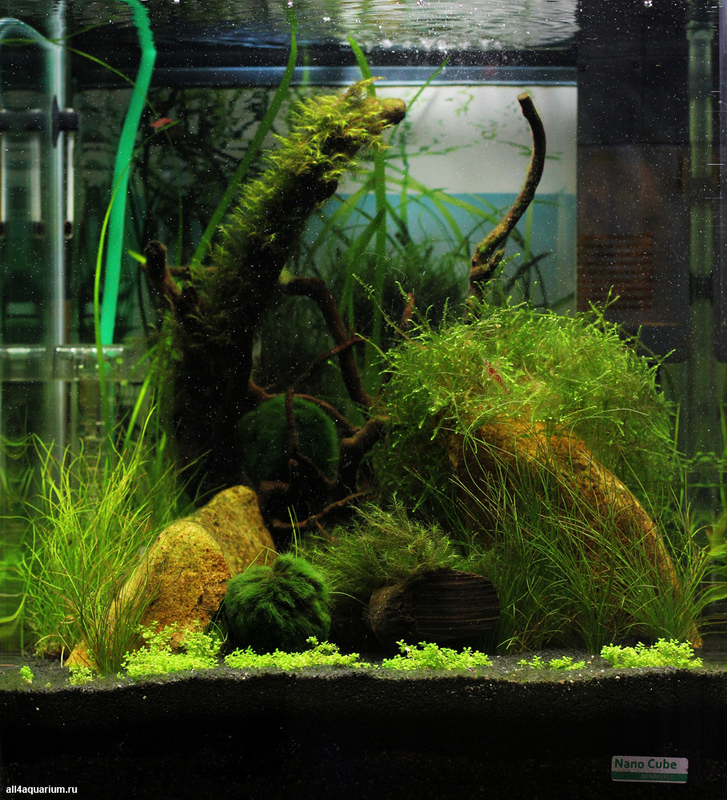 Kim Pulkki (Sweden): Very brave scape in my mind. Not my kind of scape, but I like the new way of thinking. Keep scaping! Stefan Walter (Germany): First of all the photo is stunning. Then the placement of the rocks is very natural and reminds of previously seen real waterfalls. This special aspect allows the rest of the scape to be rather unspectacular which again gives room to the main feature. Stefan Hummel (Germany): A few days ago I was travelling through Germany. Such scenes could often be captured in the real. Excellent hardscape!A few days ago I was travelling through Germany. Such scenes could often be captured in the real. Excellent hardscape! 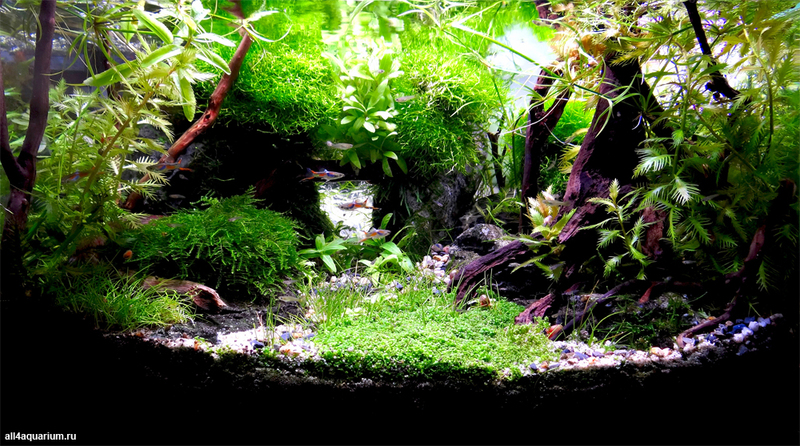 Alex Veres (Romania): Stunning little tank. The waterfall is extremely realistic. Nice job. 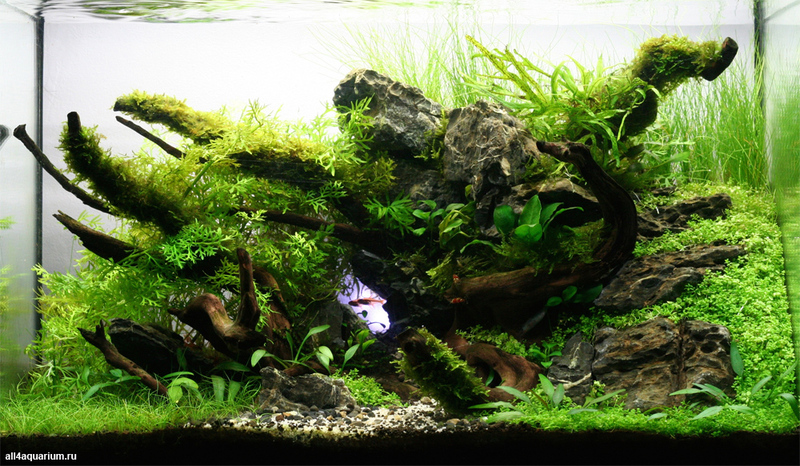 Balázs Farkas (Hungary): A very intriguing aquascape with too many types of plants. The composition and the mood is wild. Despite of its mess, it managed to get into my top 10. Congratulations. Kim Pulkki (Sweden): Another good example of how to choose the right plants. Great scape! Serkan Çetinkol (Turkey): Good rock design. I think right side not bright enough. Congratulations. 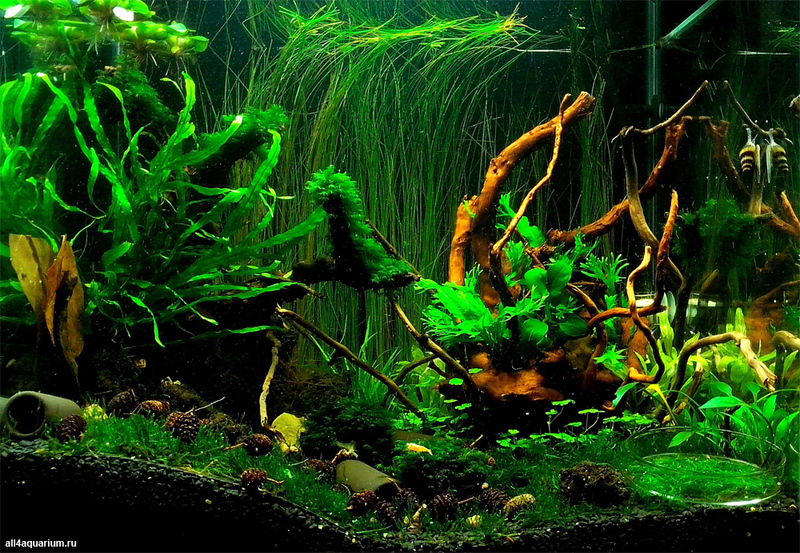 Dimitris Ioannou (Greece): Your aquarium gives me the impression of a bouquet with all shades of green. Your grooming is very good and your plants are full of health. Dimitris Ioannou (Greece): The representation of rocky mountains is very successful. Right stones and sand selection for this project. The touches of green on the rocks are wonderful. Balázs Farkas (Hungary): Congratulations. This aquascape has ranked my second. 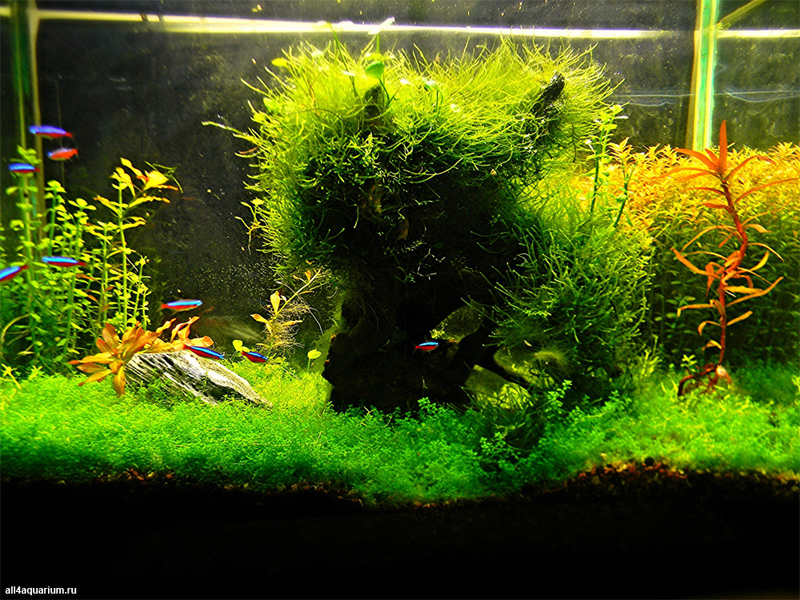 It is probably the only tank with green spot algae I have seen so far that uses its problem to add to the mood. Really original. Really natural. This is what Nature Aquarium is about. Respect. 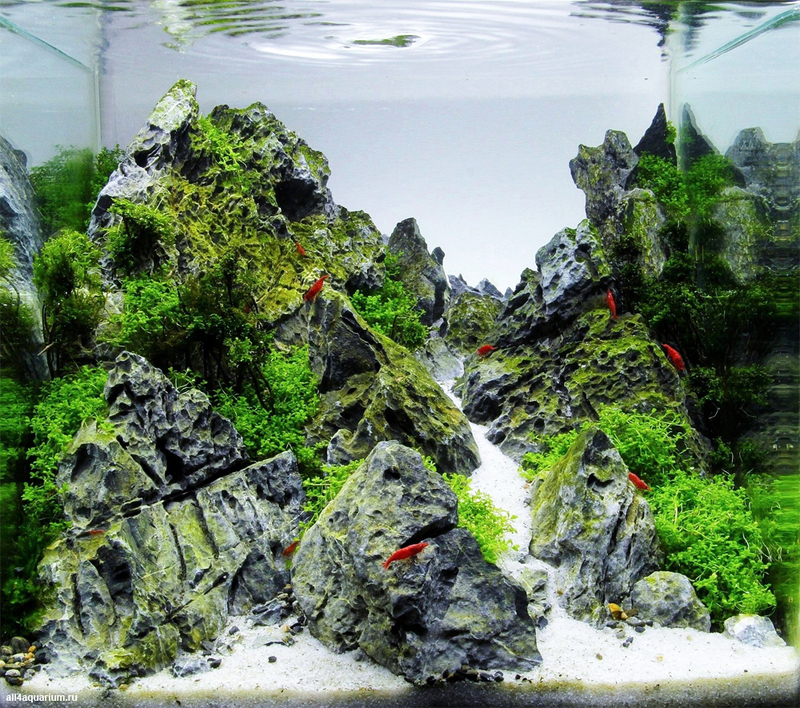 Diego Marinelli (Italy): Amazing mountain scape in a little cube. 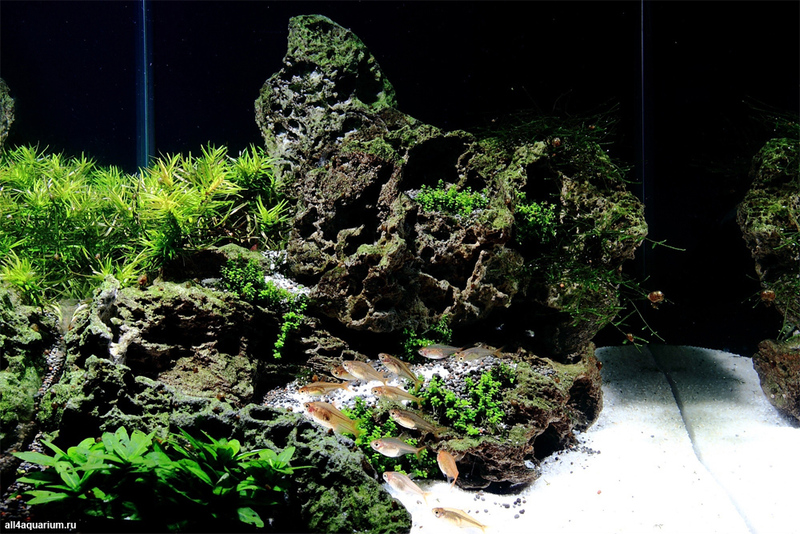 Albert Escrihuela Cáceres (Spain): For me the winner of this contest is certainly this aquarium, even the smallest detail is cared of, the position of the stones is excellent, and the selection of plants and planting is very good. The position of the rocks is very good and the transition from the front to the rear rocks is excellent. I miss fishes, in this aquarium Paracheirodon simulans or Axelrodia Blue would look very well. My personal points for this aquarium is 8.4 of 10. 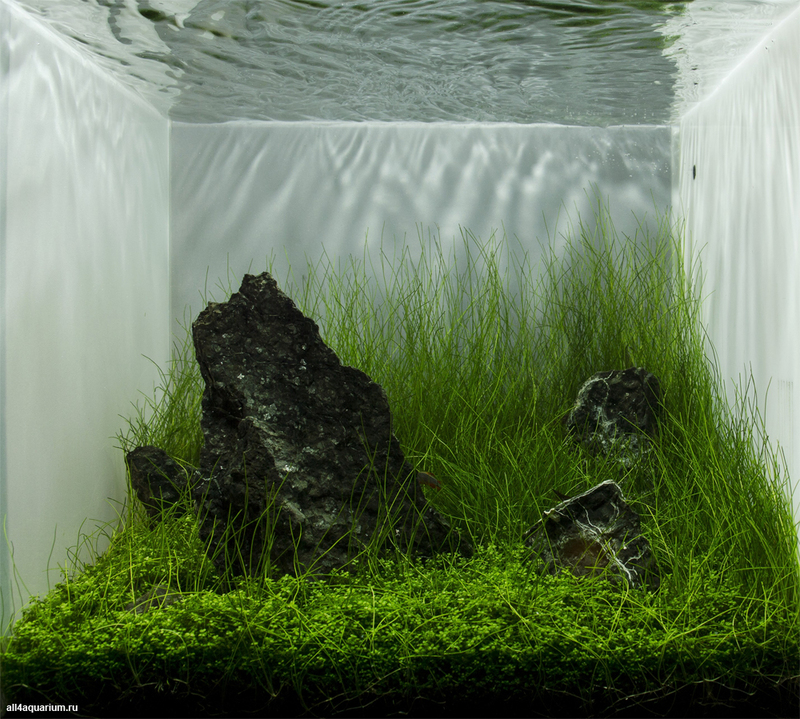 Kim Pulkki (Sweden): The best example how to create depth in a tank. You would do magic in a bigger tank I think. Just great! Alexander Grebeniuk (Ukraine): This entry reminded me of Crimea rocky massifs with mountain peonies on the rocks. The mountain peonies have the same color as Neocaridina heteropoda var. Sakura in the aquarium. Balázs Farkas (Hungary): Ranked my third. 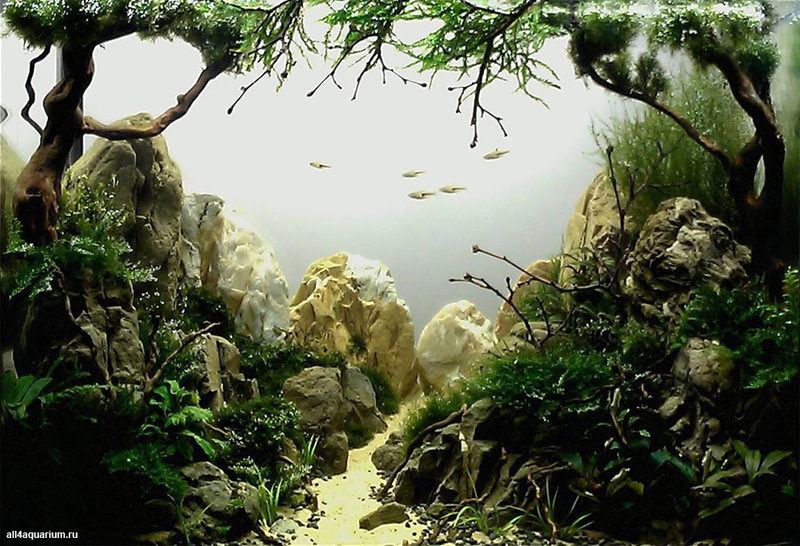 This scape has a remarkable composition, the hardscape is perfectly created. The use of moss is really natural. The white silica sand and the perfectly grouped pebbles on the right side distract the natural feeling a bit. Sergiusz Kowalew (Poland): Great composition. You can see the attention to detail. Shrimp excellent selection of the composition. Kim Pulkki (Sweden): Very good and simple rock work. Thumbs up! Serkan Çetinkol (Turkey): This is good photographing. Nice design but i think pebble colours incompatible your other rocks. Congratulations. Alexander Grebeniuk (Ukraine): In this entry I remember the concave main stone and a good solution of the placing hardscape. It is a balanced and pleasant work. Bright Caridina cf. cantonensis Red Crystal in this case are not striking, and they are a good element of the composition. Oliver Knott (Germany): A wonderful piece of art! A perfect symbiose of rocks, woods and plants. Congratulation. Stefan Hummel (Germany): A layout with great excitement and dynamism. The flowing movement of rocks and roots is in perfect harmony. Dimitris Ioannou (Greece): A wild landscape that urges you to explore it. Very well crafted setup with correct material choice, proper grooming and very good lighting. Diego Marinelli (Italy): Original work, beautiful escape in the center of the composition. Kim Pulkki (Sweden): Very mysterious and dark a bit, just like Fangorn! I don’t like the hole/cave but the rest is awesome, I like it! Serkan Çetinkol (Turkey): Fish location is amazing, fullness proportion is proper. Maybe you can slog control of ceratopteris. Congratulations. Cyrille Moresve (France): We have here also an aquarium that is original in the composition of its hardscape, in the choice of plants and planting. It looks like a bouquet. It is too bad there is no living creatures to add more life to this and brightness to the picture, because otherwise it could have ended in the first places of my ranking in all regions. Oliver Knott (Germany): Very different layout, but a great hill of nice plants in a great condition. Stefan Hummel (Germany): Plant diversity in a very beautiful composition. The layout gives the impression of a botanical garden under water. 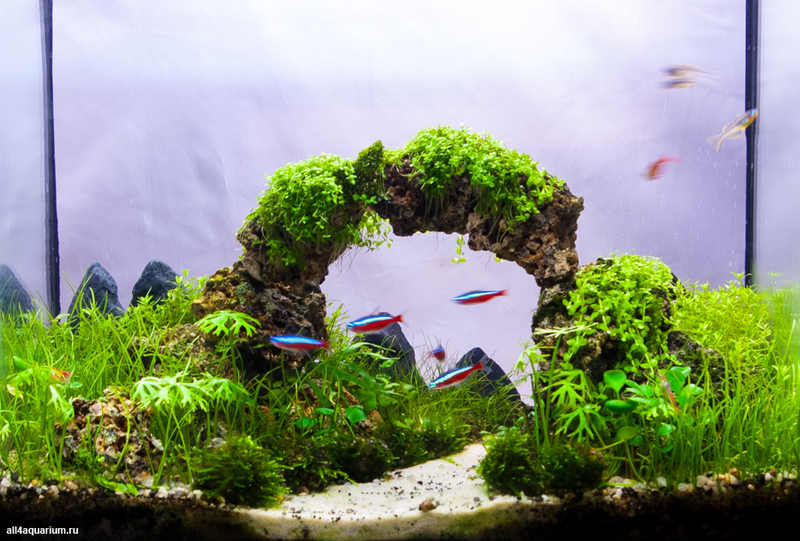 Dimitris Ioannou (Greece): A setup that doesn’t belong to a school of aquascape, it's just a garden, a lovely garden with a riot of colors. Very clean, very healthy plants, I like it very much. Sergiusz Kowalew (Poland): Very cool idea for the arrangement. Aquarium looks very natural. Should also appreciate the selection of plants, and their conditions. Deserved position. 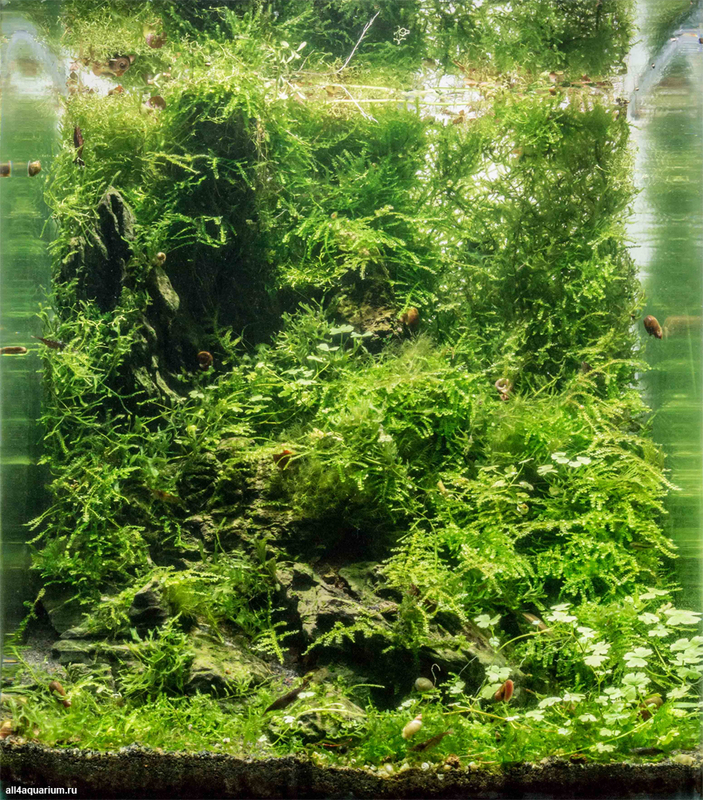 Albert Escrihuela Cáceres (Spain): The structure that holds the aquascape is very harmonious and the road has a very good position, although it is too light for decoration chosen. Shrimps are great. Plants need to be more groomed and they are too much in the front. My personal points for this aquarium are 6.7 of 10. Serkan Çetinkol (Turkey): Your plants have ultimate healthful. This is disparate design. Maybe you can added some small fish. Congratulations. Alexander Grebeniuk (Ukraine): The impossible is possible. In this composition diverse plants are together and look great with each other. There are 15 species of plants here, and how harmonious the composition looks. 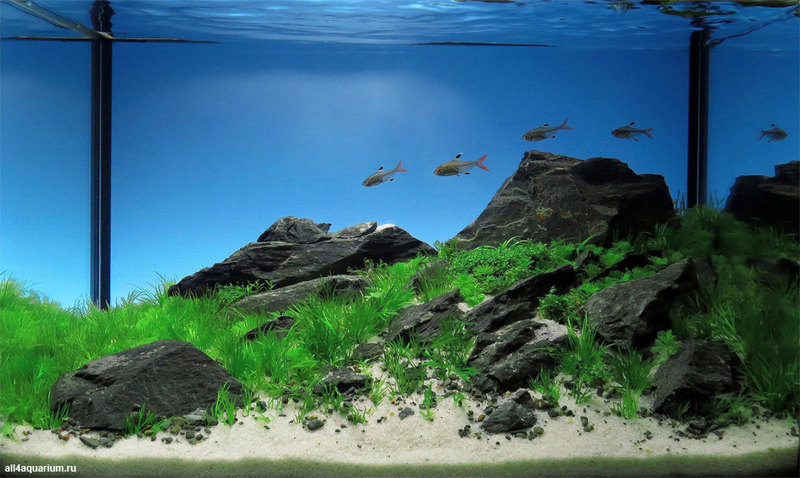 Who said it is difficult to use Echinodorus in an aquascape? Watch and learn. 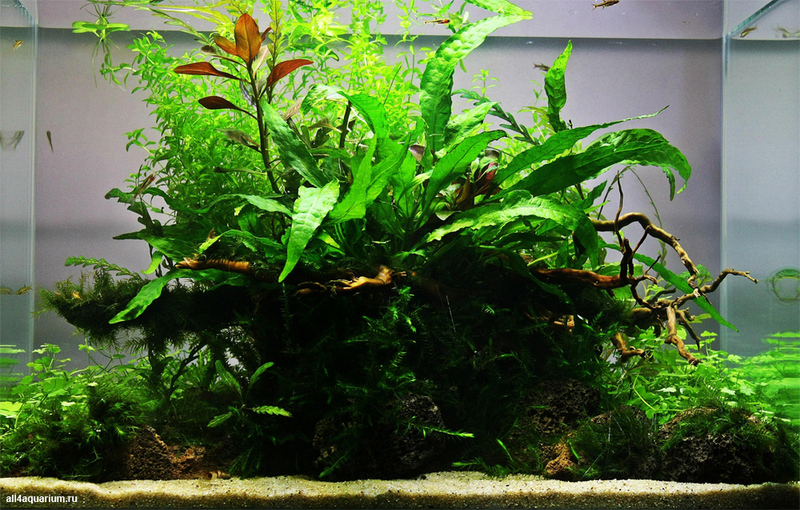 Maybe we see the beginning of a new style in aquascaping - Ikebana. 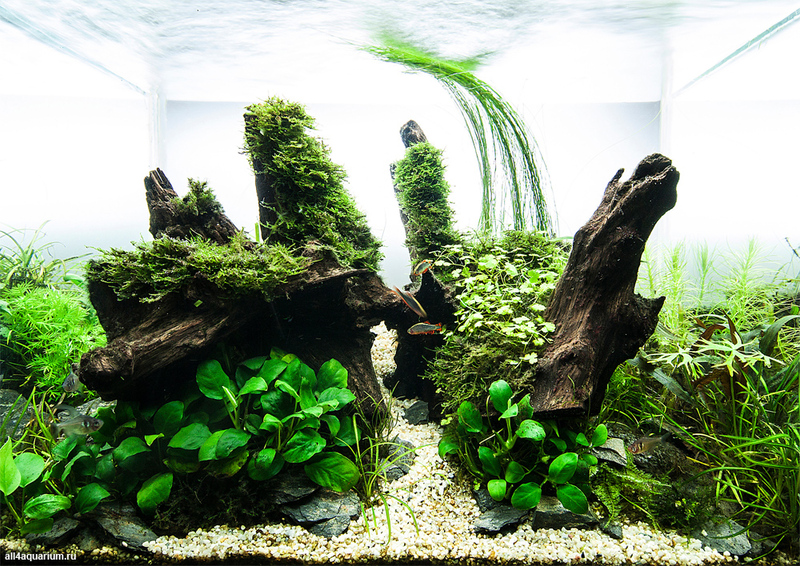 Cyrille Moresve (France): Is is a beautiful aquarium, balanced, well maintained. 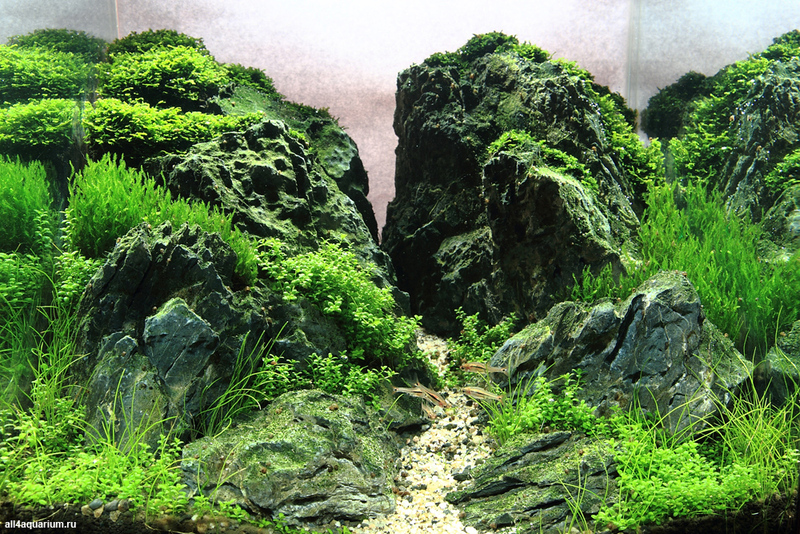 Stefan Hummel (Germany): Powerful rock on the right side of this aquascape increases the tension in this layout. The scene is photographed very good, the fishes are directly in front of the dominant focal point. Sergiusz Kowalew (Poland): A good selection of stones. An interesting effect of moss. It would have been much higher if properly work on the third plan. Bonus points for a good selection of fish to the whole arrangement. 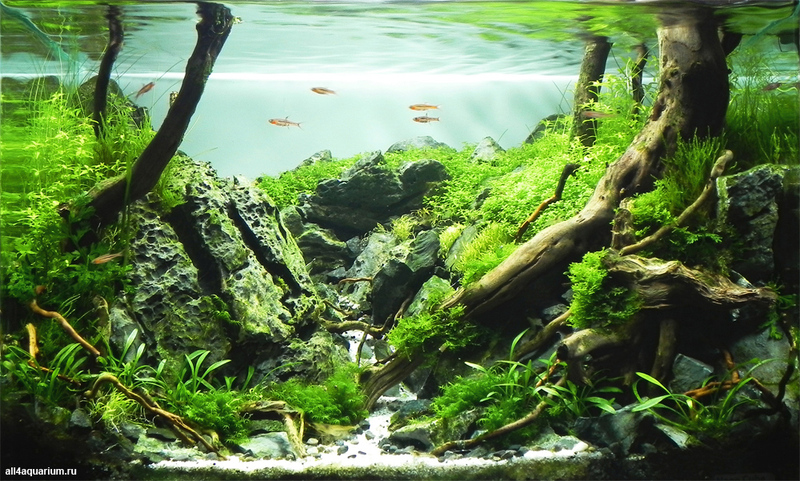 Balázs Farkas (Hungary): This is a very natural aquascape, due to its somewhat unusual ratio in nano tanks this has a lot of potential. Shame about the quality of photography, it destroys the experience. I would have ranked this perfect little scape a lot higher if I had not been distracted by the photo quality. Congratulations to the creator for the perfect nano vision. Albert Escrihuela Cáceres (Spain): The structure of mountains on both sides of this layout is good although the path is not completely defined. Plants should be more groomed and the photo should be a bit better, it is not very good. My points for this aquarium are 6.1 of 10. Stefan Walter (Germany): Nice idea and even some great details on the tree but in parts not really worked out. The featuring of Planorbis did not really succeed. Since the arc consists obviously of 2 parts this feature is lost. Background well chosen but in my view unspectacular for the cause as there is nothing “lost” about this arc which I would expect. Photography otherwise can be improved. Alex Veres (Romania): Nice "tree scape", skillfully done. Your tank reminds me of a Japanese tales book cover. The tree branch and Riccardia helped a lot on this sensation. 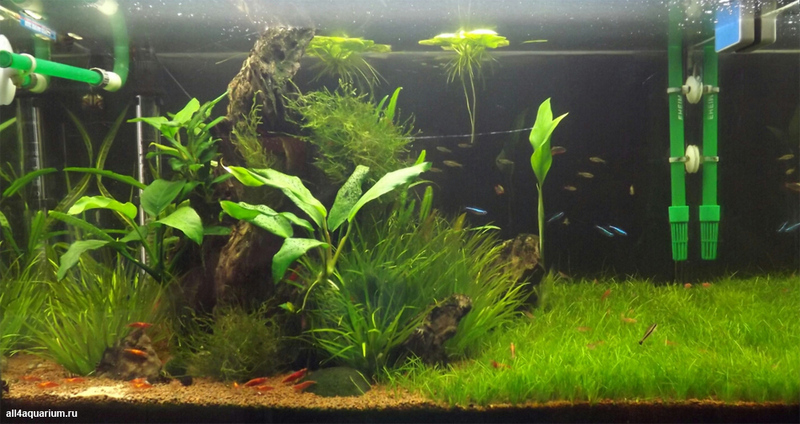 Cyrille Moresve (France): It is another original aquarium with beautiful colors. I just regret the lack of structure in the planting and the carpet of Hemianthus calitrichoides is not as good yet. Oliver Knott (Germany): A wild but very nice layout. 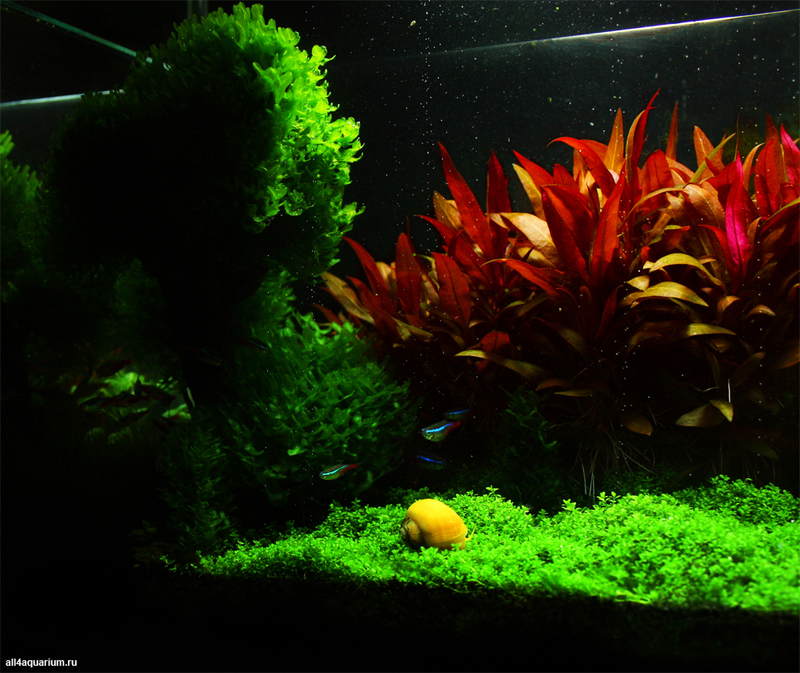 Alex Veres (Romania): Beautiful plants, and an overall pleasing look. Stefan Walter (Germany): The idea of the cave as such is not bad at all. I like these things. But both choice of rocks and unclear entry to the cave makes the scape loose a lot. 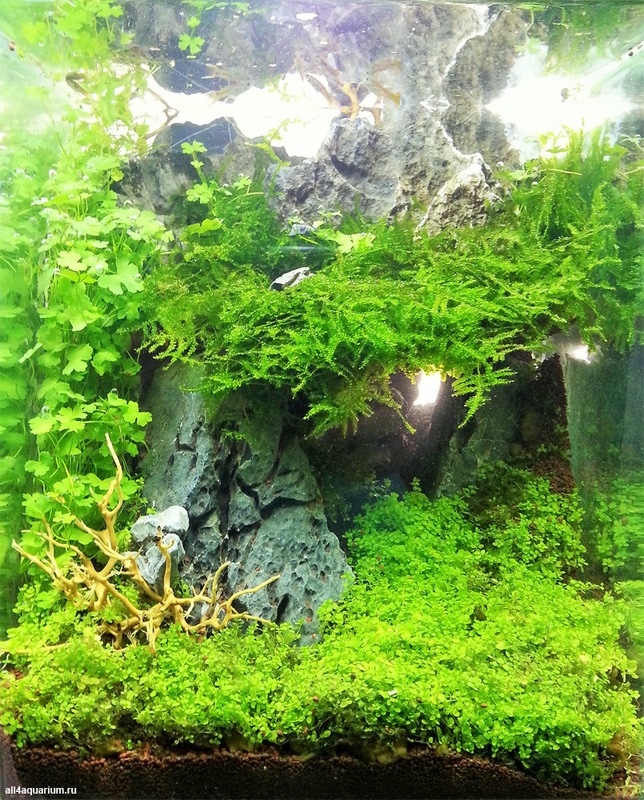 The overhanging moss is just the right idea but that is it for the cave, nothing more. The foreground is a bit boring. However, the plants look healthy. Photography is confusing and lighting should be more precise. No depth at all though exactly this should be required and actually easy to perform. Stefan Walter (Germany): Photo: leaving the filter parts inside during the photo is not helping the effect of the picture. Grooming and choice as well as placement of plants is questionable and the root as the name indicates does not make for a center part in this picture. No concept visible.